July 28, 2007 -Mitolo Reiver Barossa Valley Shiraz 2004 - RM 91 $49 - Thick and rich, ripe, concentrated, dense black fruits, black currant, slightly sweet, a bit of mineral and cedar, integrated oak, and soft tannins. 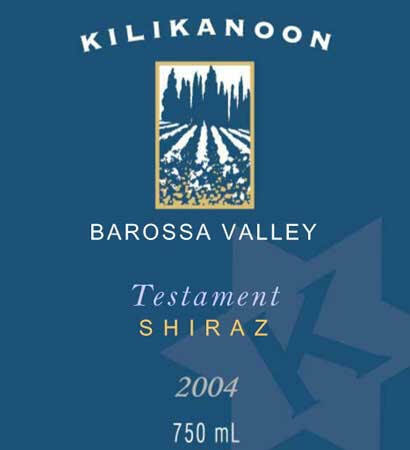 July 22, 2007 - Kilikanoon Parable Barossa Valley Shiraz 2004 - RM 93 RP 96 - Rich, full flavored fruit forward - ripe plum, red raspberry, currant, and blueberry with a hint of sweet oak and vanilla on the full finish. July 17, 2007 - Mitolo Jester McLaren Vale Cabernet Sauvignon 2005 - Big, forward fruit - slightly tart cherry, smoky black berry, ripe loganberry, a hint of camphor and charcoal on the finish. 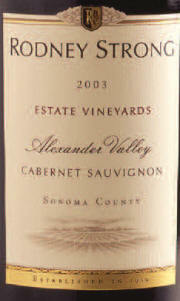 Avalon Napa Cabernet Sauvignon 2005 - Soft, light-medium bodied, plum, currant, , vanilla and bark. 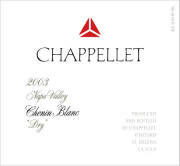 Tasted at Talula's in Arlington, VA.
July 16, 2007 - Chappellett Napa Valley Mountain Cuvee 2004 - RM 90; WE 90 - $26 - Full flavored fruit of black berry, ripe black cherry, a hint of soft vanilla, sweet oak, tea modest tannins on the finish. Bordeaux style blend - Cabernet Sauvignon (60%), Merlot (34%), Cabernet Franc (4%), Petit Verdot (2%). 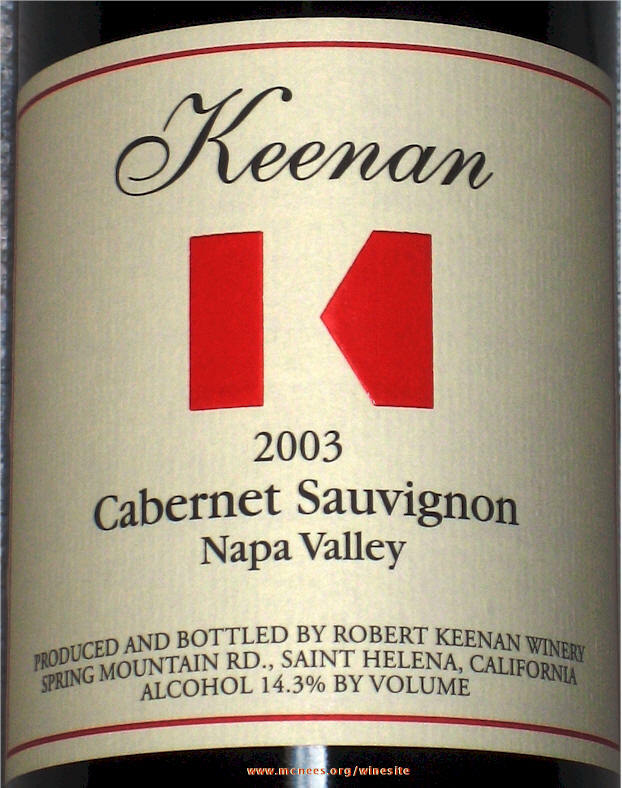 July 10, 2007 - Keenan Napa Valley Spring Mountain Cabernet Sauvignon 2003 - RM 92 W&S 92 - Deep bright garnet colour. 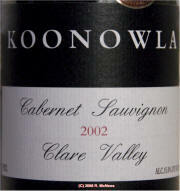 Forward full bodied fruit with chewy plum, raspberry and currant flavors. Winemaker notes - The Estate grown Cabernet imparts amazing concentration and remarkable structure, while the portion of Cabernet harvested from the Pope Valley region of Napa has added complex aromas and a balanced mid-palate. 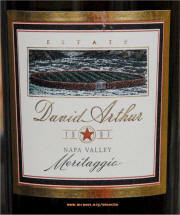 Merlot from the Napa Carneros district imparted ripe berry nuances and plenty of forward fruit. Flora Springs Trilogy Napa Valley 2003 - RM 91 WE 91 CS - Bordeaux style blend that resembles the earthy black berry and black cherry fruit, depth, breadth and elegance of a left bank claret. 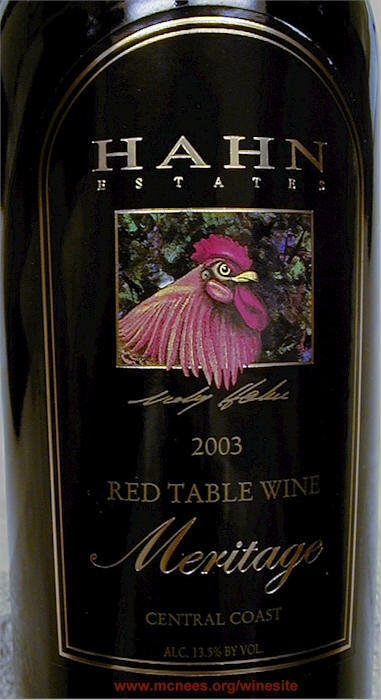 Heathcote II, Heathcote, Victoria, Australia Shiraz 2004 - RM 94 RP 94 - $40 - Inky/purple color. Huge full beautiful aromas of fruit that permeate the room upon opening. Full bodied, rich, structured, full forward flavors of graphite, blackberries, black raspberries, chewy currant, mocha and mineral. Tasted BYOB at Francesca's for RG Ad Board Dinner. July 7, 2007 - Heathcote II, Heathcote, Victoria, Australia Shiraz 2004 - RM 94 RP 94 - $40 - Inky/purple color. Huge full beautiful aromas of fruit that permeate the room upon opening. Full bodied, rich, structured, full forward flavors of graphite, blackberries, black raspberries, chewy currant, mocha and mineral. 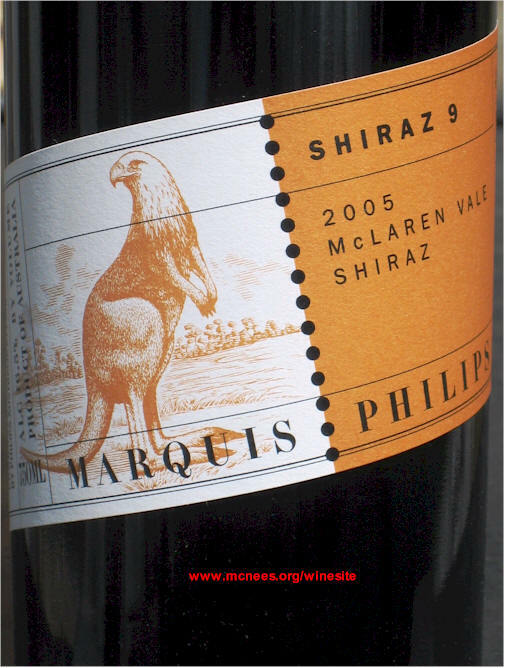 July 4, 2007 - Marquis Phillips Shiraz 2005 - RM 88 RP 91 - Big full bodied - essence of mocha, raisins, pepper and spicy, earthy licorice. Great value at under $15. July 1, 2007 - Laetitia Limite Pinot Noir 2005 - RM 90 - Dark, black cherry and plum, balanced and complex, layers of blackberry, mushroom and dusty earth. Heller Estate Central Valley Meritage 2003 - RM 90 Black currant, ripe black cherry, plum and cassis fruit with a structured finish of soft tannins and oak. 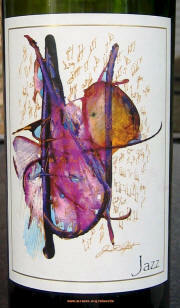 Leaping Lizard Napa Valley Merlot 2003 - RM 88. Flavors f blueberry and blackberry with a hint of mocha tinged chocolate, vanilla and oak. Tasted w/ L and Erin at the outdoor Garden Cafe at the Art Institute of Chicago. 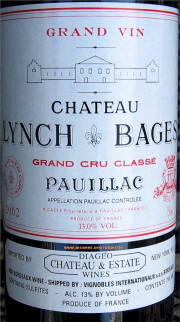 June 30, 2007 - Chateau Lynch Bages Pauillac Bordeaux 2002 - RM 91 - WS 92-94 - RP 90-92 -"Aromas and flavors of currant, bright berry, spices, cedar and earth - medium bodied, with soft smooth tannins and a long, currant and mineral finish." Chateau Clerc Milon Pauillac Bordeaux 1997 - RM 89 RP 89 - Second wine of Chateau Mouton Rothschild. "Subtle fruit, blackcurrant and chocolate aromas, hints of spice and smoke. Medium bodied with soft smooth tannins on a long earthy finish. Tasted w/ L and Bob & Gloria, BYOB at Angelis. 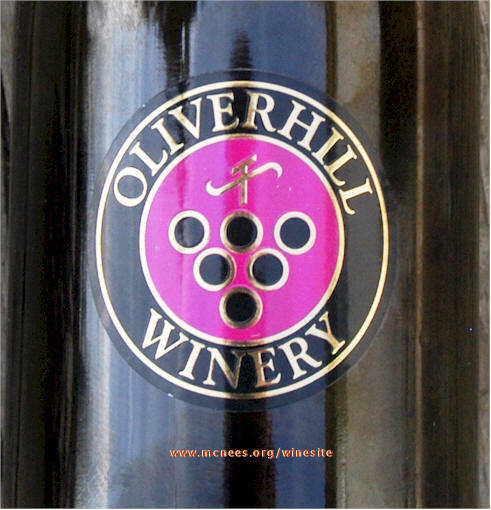 purple-hued wine offers layers of blackberry and currant fruit intermingled with spicy new oak, licorice, cedar, and loamy soil characteristics. 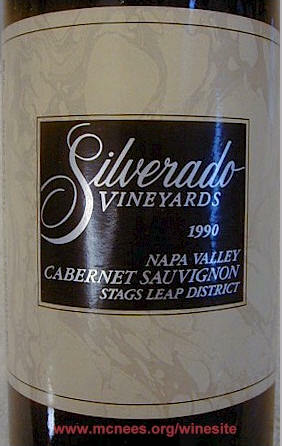 Full bodied and voluptuous, but not over the top, this beauty should drink well for 10-15 years." Robert Parker's The Wine Advocate, Issue 161, Oct 31, 2005. From the cellar, BYOB, tasted w/ L, Erin & Johnny, Ryan & Michelle at Cafe Matou near Ryan's. long full finish. Duel of old world vs. new contrasting styles. Tasted on the deck w/ L & John and Cath McM 'welcome' dinner. 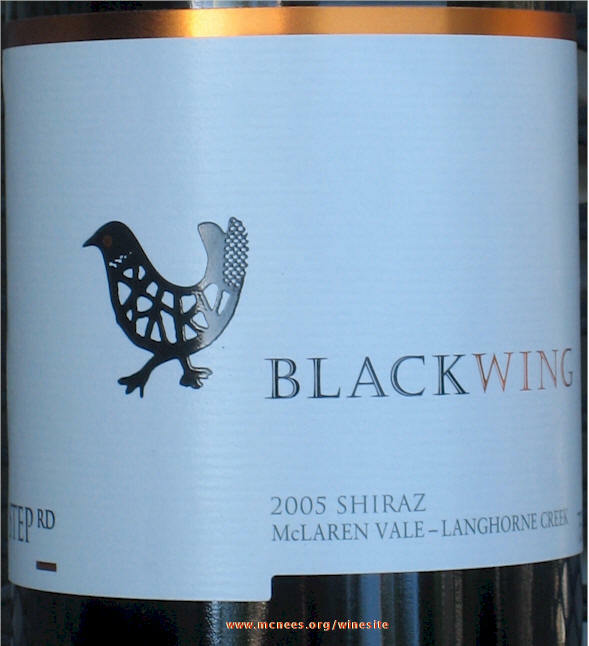 June 19, 2007 - BlackWing McLaren Vale Langhorne Creek Shiraz 2005 - RM 87 - WA 90 - $10 Medium bodied, mineral, black cherry, smoke, spice and earth. 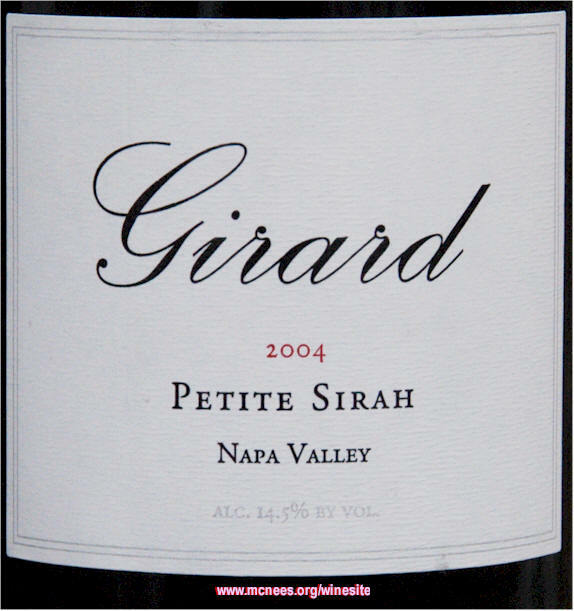 June 17, 2007 - Markham Napa Valley Petit Syrah 2001 - RM 91 - $24 - Dark purple - huge fragrance and mouthful of forward fruit currant, black raspberry, an undercurrent of cedar and black pepper with a long smooth subtle mocha finish. 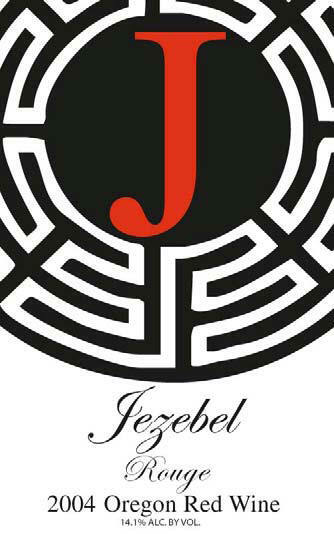 June 12, 2007 - Daedalus Cellars Jezebel Rouge 2004 - RM 87 - An interesting blend of 30% Cabernet Franc, 22% Merlot, 19% Syrah, 15% Pinot Noir, 7% Cabernet Sauvignon and 7% Zinfandel, this is a structured and well-balanced wine with rich, forward fruit flavors. 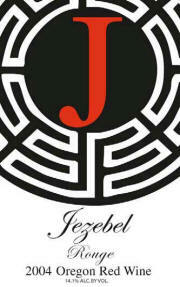 It lacks the complexity, polish or sophistication one might expect of such a blend. Rather its simple and easy drinking. Release price was $18. 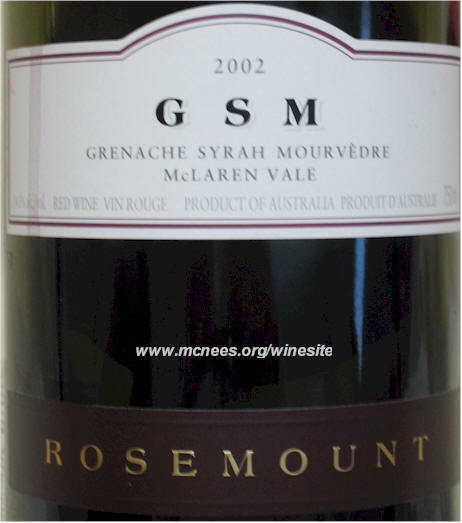 Tasted w/ JK at Idylwild Grill in Falls Church, where as always the usual Sesame Pan Seared Tuna was fabulous..
June 10, 2007 - Rosemount Balmoral McLaren Vale Syrah 1997 - RM 86 - Earthy and a slight bit corked or perhaps end of life? Will try another soon from the cellar. Tasted w/ L at current favorite neighborhood restaurant Angelis. BYOB from the home cellar. 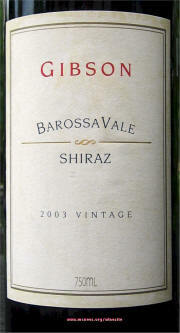 June 4 & 9, 2007 - Gibson Barossa Vale Shiraz 2003 - RM 91 $40 - Rich, full flavored full bodied, dark - berry, plum, a hint of blueberry and mineral. 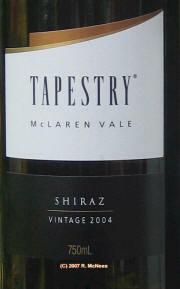 Tapestry McLaren Vale Shiraz 2004 - RM 88 - Well balanced dark berry, black cherry, mocha and a hint of mineral. Tasted w/ L, Ryan & Michelle, at Erin and Johnny's to inaugurate their new deck and for Evelyn's birthday bar-b-que w/ Keith and Alec. 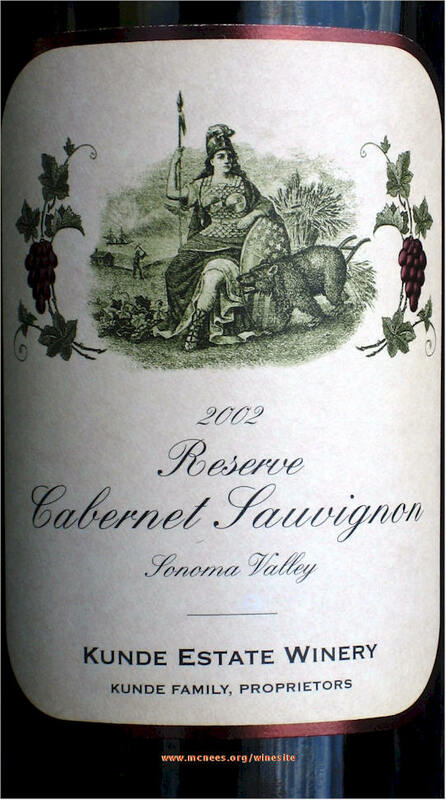 June 7, 2007 - Louis Martini Napa Valley Cabernet Sauvignon 2004 - RM 88 - Medium balanced berry, plum, slightly earthy with a hint of cedar - blend of 78% Cabernet Sauvignon, 18% Merlot, 1% Cabernet Franc, 1% Sangiovese, 0.5% Petite Verdot, 0.25% Petite Sirah, 0.5% Syrah. 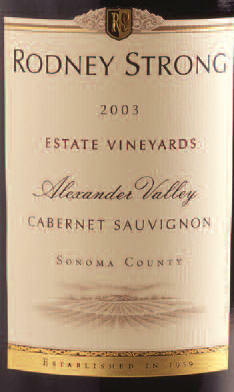 - Rodney Strong Sonoma County Alexander Valley Cabernet Sauvignon 2004 - RM 89 Medium bodied, well balanced - berry, plum and a hint of mocha on the finish - 92% Cabernet Sauvignon, 7% Merlot, 1% Cabernet Franc. 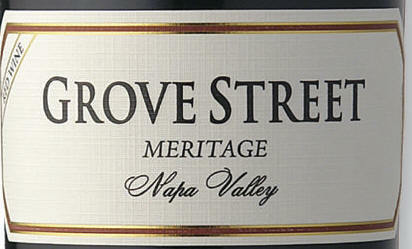 Grove Street Napa Valley Meritage NV. RM 87 - Blend of Cabernet Sauvignon, Merlot, Malbec and Cabernet Franc. 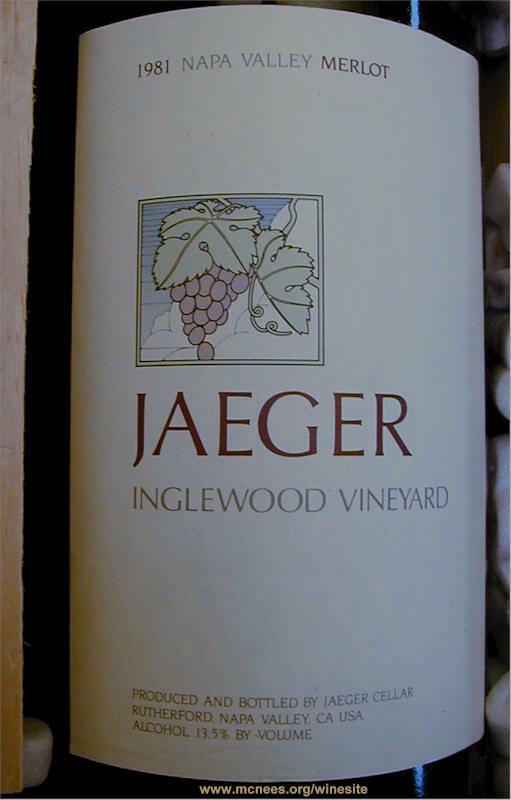 A majority of the grapes were sourced from the Beckstoffer and Jaeger vineyards. 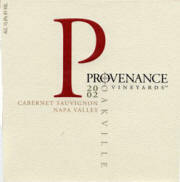 Producer notes - Deep hues of red and purple from dense fruit. Rich, ripe aromas of intense, ripe blackberry and currant laced with tones of chocolate and cedar - flavors of ripe berry, licorice and toasted oak follows with nice concentration and texture. Incredible value at $12. Tasted at Jan & Bill's in Huntington Beach. 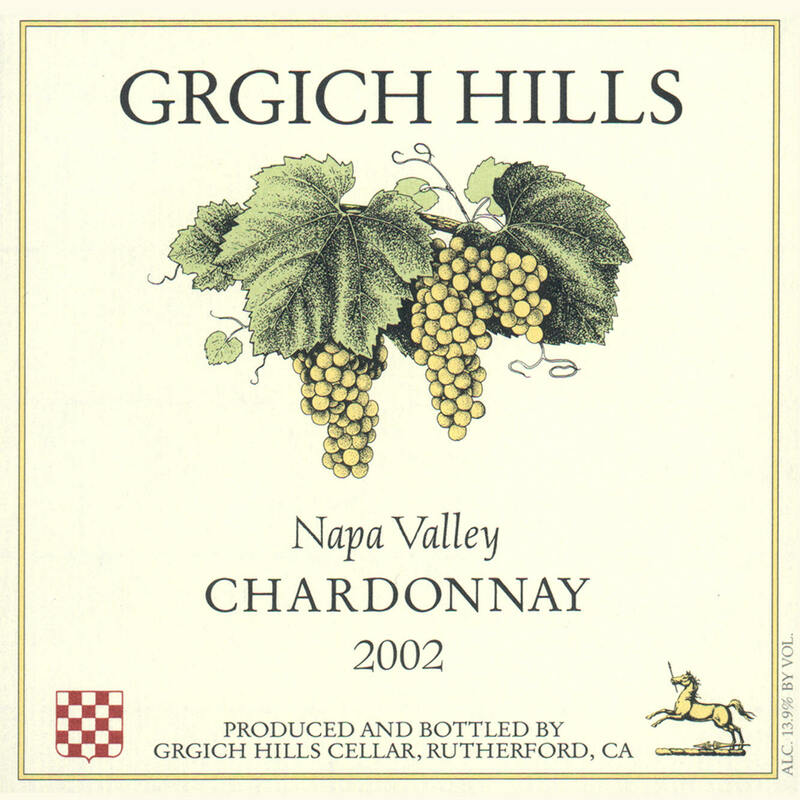 June 6, 2007 Grgich Hills Napa Valley Chardonnay 2004 - RM 89 - Medium bodied crisp, well balanced, clean balance of oak, citrus, fruit and hint of mineral and honey. 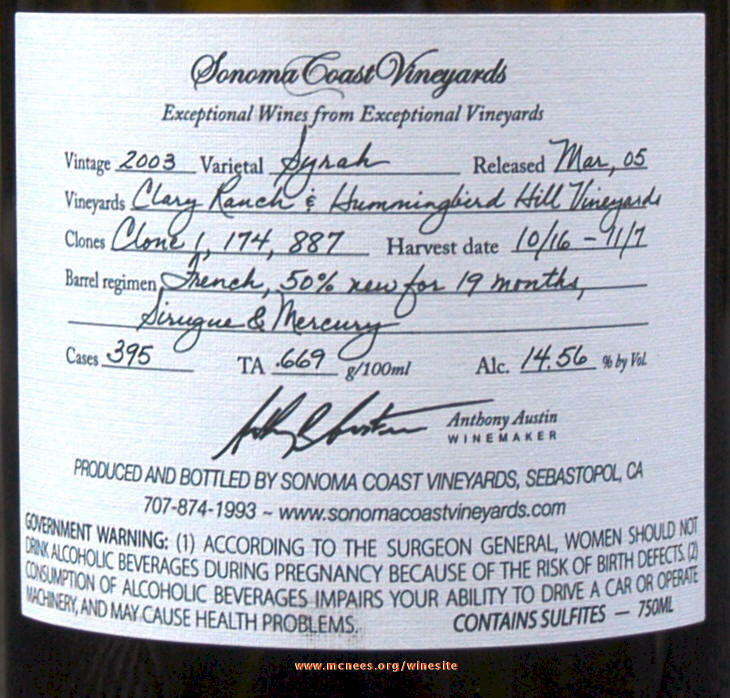 This is the first Estate bottled chardonnay from this well-known producer. 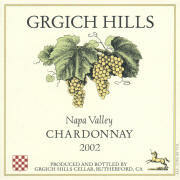 The grapes are from their American Canyon and Carneros vineyards and from the southern tip of Napa Valley near the bay. Perfect compliment to grilled whitefish at Mistral Restaurant in Sherman Oaks. 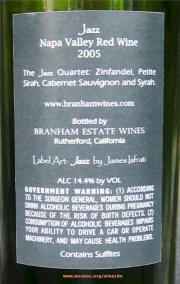 June 3, 2007 - Branham Estate Jazz Napa Valley Blend 2005 - RM 88 - Interesting blend of Zinfandel, Petiti Syrah, Cabernet and Syrah. Full bodied and flavored. A bit bold as four flavors compete for dominance. Dark berry, a hint of licorice and bark. Tasted with L and Dr. Pat at Francesca's on Taylor in Chicago after visiting E&J's and Ryan's. Saturday June 2, 2007 - Elderton Barossa Valley Shiraz 2003 - RM 88 - Dark purple. 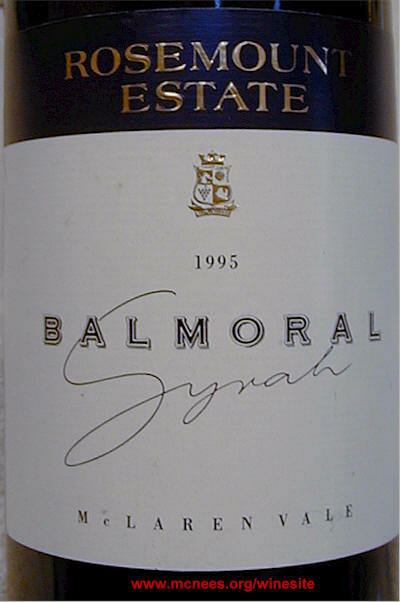 Rich ripe plum, mocha and vanilla overtaken by mineral. - Other reviews: The Wine Buyer The dark, inky color and the big nose with sweet aromas of blackberry, smoke and licorice is a portent of the extraction to come. On the palate this wine is extremely fruit forward with ripe and delicious flavors of blackberry, plum and mocha with well integrated, slightly spicy tannins on a lingering finish. Score: 93. November 15, 2005. 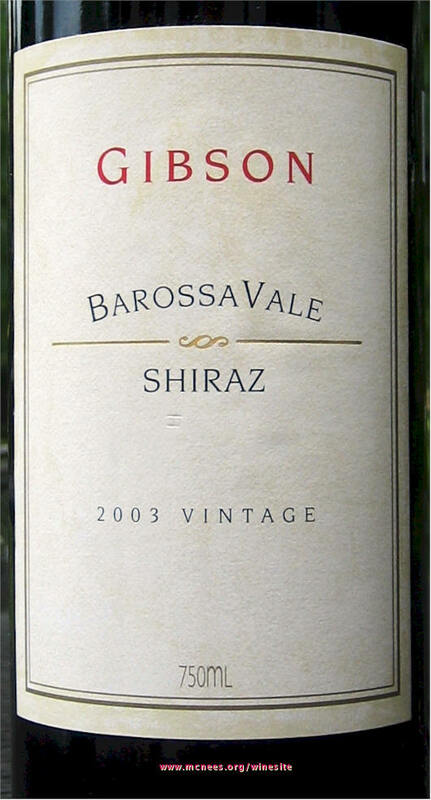 The Wine Advocate "The 2003 Shiraz Barossa boasts a dense purple color, aromas of creme de cassis, asphalt, smoke, and earth, well-integrated, sweet, toasty oak, and a big, full-bodied, concentrated personality. 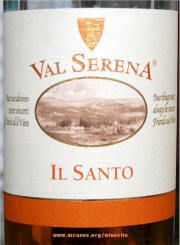 Great fruit, huge body, sweet tannin, and a long finish suggest it should hit its peak in 2-4 years, and last for 12-15. Score: 91. �Robert Parker, Oct 31, 2005." Tapestry McLaren Vale Shiraz 2004 - RM 88 - Well balanced dark berry, black cherry, mocha and a hint of mineral. 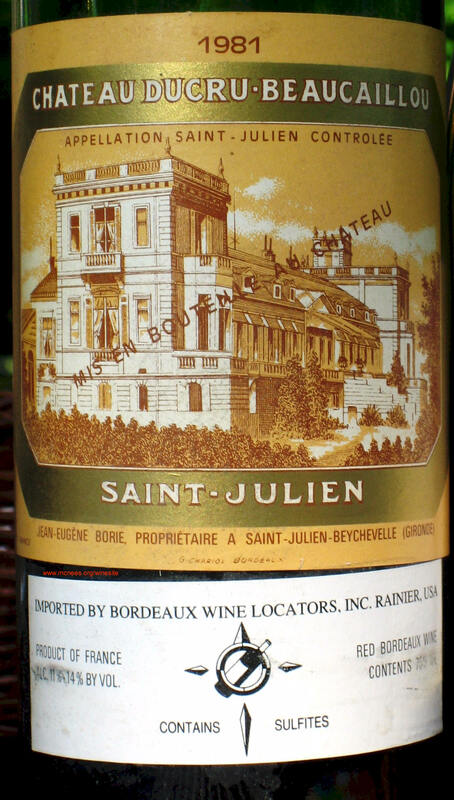 May 31, 2007 - Chateau Ducru Beaucaillou St Julien Bordeaux 1981 - RM 88 - Lots of life left in this vintage cellar selection - medium bodied, earthy, leathery, black cherry, cassis and tobacco. May 28, 2007 - Elan Vineyards Napa Valley Cabernet Sauvignon 1994 - WS 88 RM 89 - Supple black cherry, plum, berry and chewy smoky, toasty oak on a moderate tannin finish. 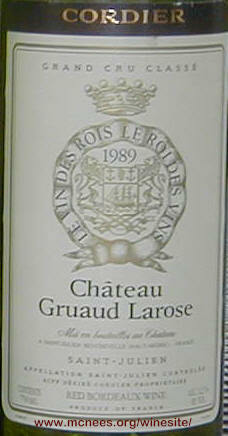 May 27, 2007 - Chateau Gruaud Larose St Julien Bordeaux 1989 - RM 89 WS 93, 91 - Earthy leather, tobacco, a hint of tar mixed with black cherry and berry with moderate tannin finish. 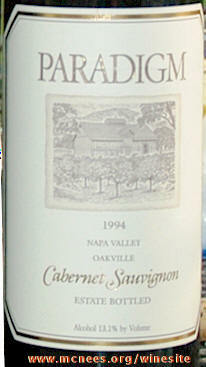 Sequoia Grove Napa Valley Cabernet Sauvignon 1989 - RM 87 - Tasted at Bill C's commemorating Matt's graduation. 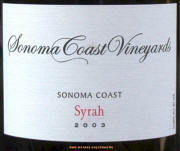 May 23, 2007 - Sonoma Coast Vineyards Syrah 2003 - RM 90 - Dark, medium bodied berry, a hint of spice,cedar, tar, bark and mocha. Tasted at Idywild Grill in Falls Church with JK. 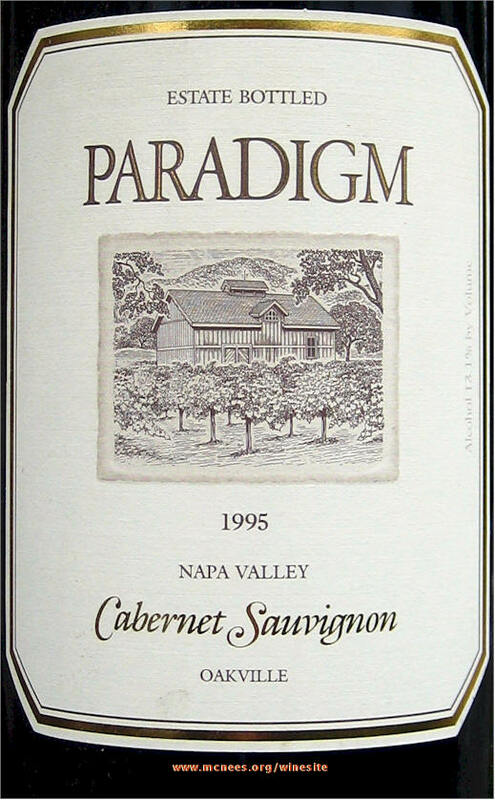 May 22, 2007 - Paradigm Napa Valley Cabernet Sauvignon 1994 - RM 91 WS 92 - Dark inky color. Full forward fruit flavors of currant, ripe plum, black cherry, cedar and a hint of anise and milk chocolate on a full firm finish. 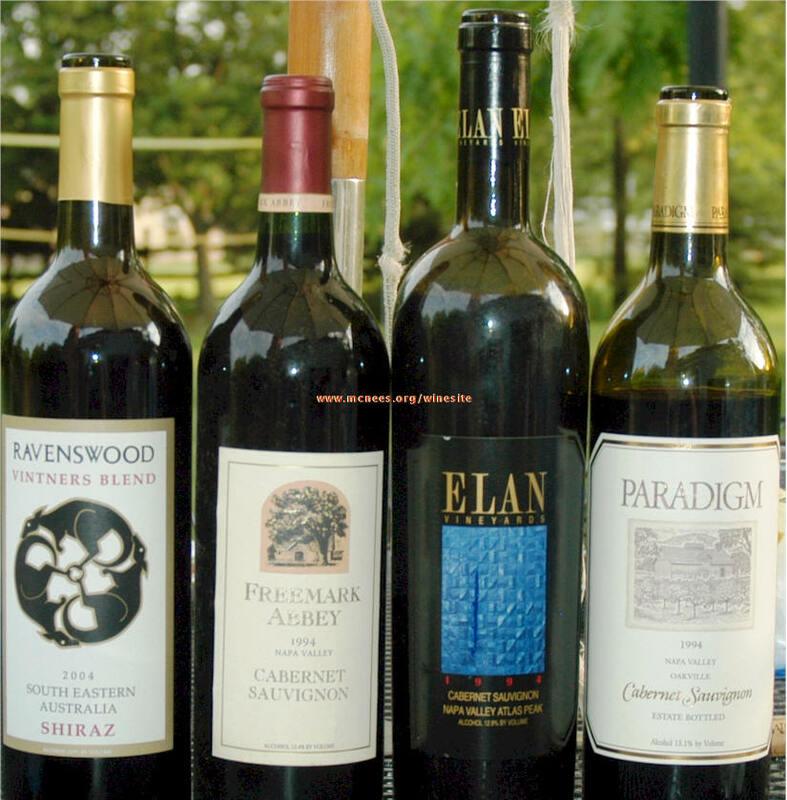 Elan Vineyards Napa Valley Cabernet Sauvignon 1994 - WS 88 RM 89 - Supple black cherry, plum, berry and chewy smoky, toasty oak on a moderate tannin finish. 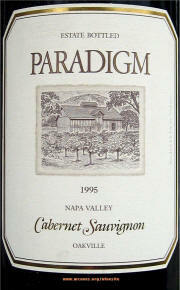 We enjoyed Elan and Paradigm as participants of our 98 and 99 Napa Wine Experiences. Ravenswood South Australia Shiraz 2004 - RM 88. Review to follow. Gala family surf & turf 'double nickel' birthday dinner w/ L, E&J, R&M, and ATM. 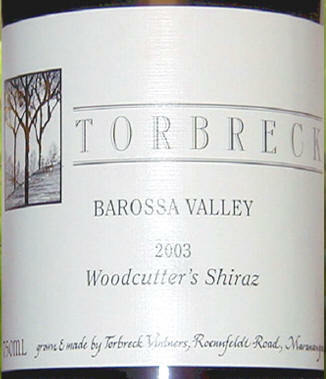 May 16, 2007 - Torbreck Barossa Valley Woodcutters Shiraz 2005 - RM 90 RP 92 - $20 - Dark inky colour. Bouquet of mineral detracts from the huge flavors of blueberry, blackberry, cassis and licorice on the smooth tannin finish that closes with tinny mineral. Parker puts it imaginatively well in his review - "The 2005 Woodcutters Shiras may be the finest David Powell has yet produced. This beauty offers dazzling layers of fruit, texture, richness, and purity. 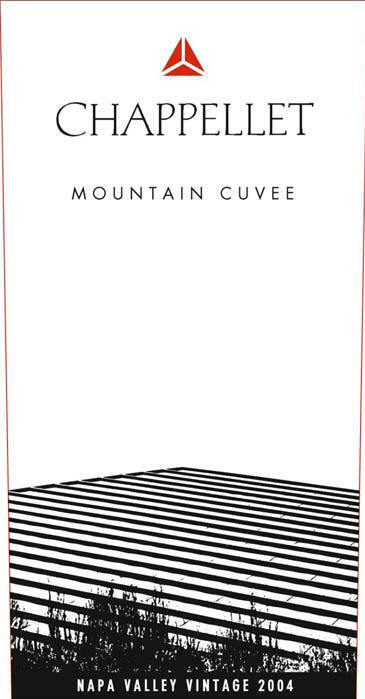 Blackberry jam, cr�me de cassis, licorice, white flowers, and black olive scents jump from the glass of this full-bodied, silky-textured, gorgeous red. It is meant to be drunk during its first 2-4 years of life. This knock-out effort is one of the great values in the marketplace. 92 points, Wine Advocate." May 12, 2007 - Chateau Ducru Beaucaillou St Julien Bordeaux 1981 - RM 88 - Lots of life left in this vintage cellar selection - medium bodied, earthy, leathery, black cherry, cassis and tobacco. 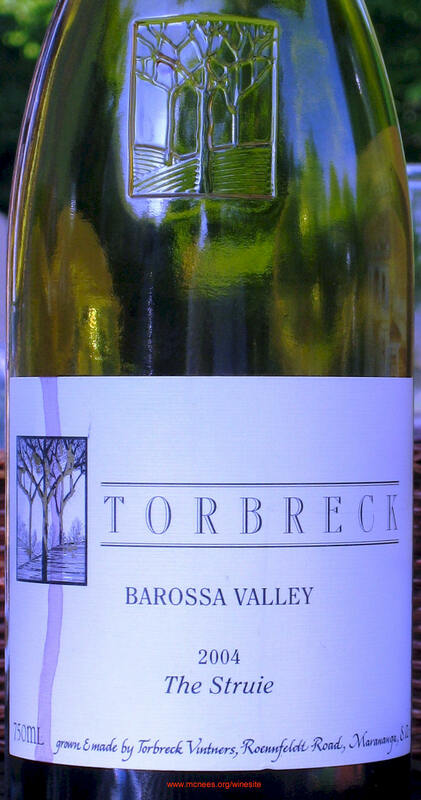 Torbreck, The Struie Barossa Valley Shiraz 2004 - RM 92 RP96 - $40 - Full bodied, dark, purple, chewy full firm tannins, ripe berry, black raspberry, mineral, camphor, a finish of licorice, tar and bark. Markham Napa Valley Petit Syrah 2001 - RM 91 - $24 - Dark purple - huge fragrance and mouthful of forward fruit currant, black raspberry, an undercurrent of cedar and black pepper with a long smooth subtle mocha finish. Tasted w/ L, Evelyn & Keith, Erin & Johnny, Ryan, and Alec for gala Mother's Day celebration surf & turf dinner on the deck. May 7, 2007 - Fantesca Estate & Winery Napa Valley Spring Mountain Cabernet Sauvignon 2002 - RM 93 - Full bodied, firm structured, polished, well balanced harmonious flavors of red currant, raspberry, blackberry, spice, and a hint of cassis on a long firm tannin finish. Fantesca Estate & Winery Los Carneros Chardonnay 2005 - RM 91- Well balanced, full bodied - essence of citrus, buttery, subtle oak and nut fruits on a long full puckering finish. Limited production releases available at the winery on-line and at some finest restaurants(www.fantesca.com) - get some while you can! 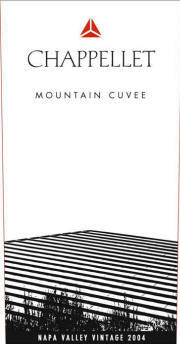 The second release for of this 'dream team' of the new owners Duane & Susan Huff and winemakers Kirk and Nils Venge. Tasted compliments of the producers, these are a real treat, worthy of a special occasion such as our gala family steak and king crableg dinner w/ L, Alec, Erin & Johnny. 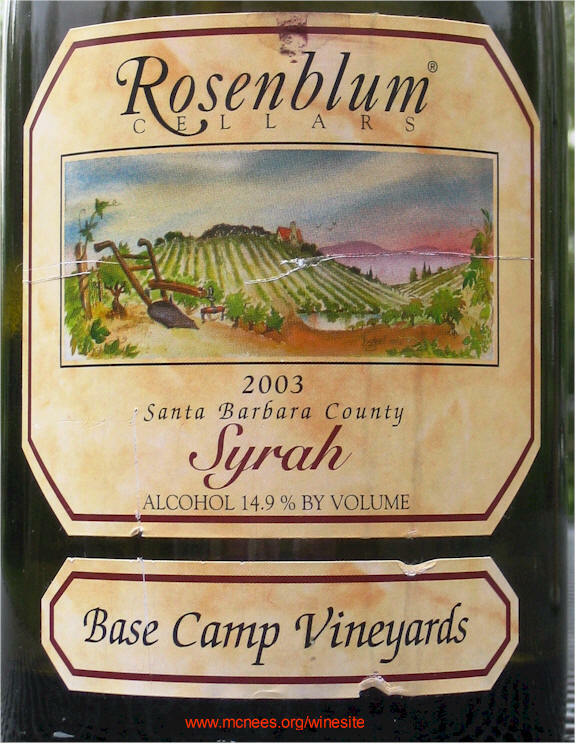 May 4, 2007 - Rosenblum Cellars Santa Barbara County Base Camp Vineyards Syrah 2003 - RM 89 - $15 - Full bodied, super ripe sweet fig and dark berry and black cherry. Good value selection. May 2, 2007 - Fantesca Estate & Winery Napa Valley Spring Mountain Cabernet Sauvignon 2002 - RM 92 RP 90 - Dark ink colour, firm tannins and concentrated, black currant, licorice with a finish of black raspberry and hint of dark chocolate. 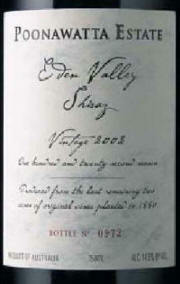 Northstar Columbia Valley Merlot 2002 - RM 90 - Rich, full-bodied wine, flavors of cassis and red plum with a firm finish. 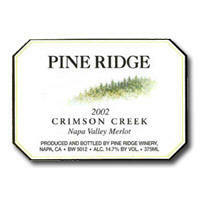 Pine Ridge Crimson Creek Merlot 2003 - RM 88 - Medium bodied - berry, cherry, and hint of vanilla, tea and tobacco. with smoky, toasty finish. Tasted with Chris S., Michael S., Gene G., and KD at Smith & Wollensky in Chicago - DoDIIS dinner. 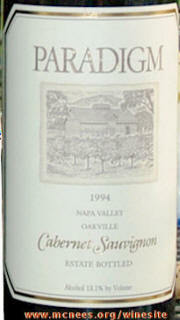 April 28, 2007 - Robert Craig Napa Valley Affinity 1997 - RM 93 - Rich full bodied. A bit earthy. Fruit filled with currant, black berry, cassis and black cherry. 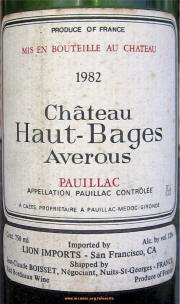 (82% Cabernet Sauvignon, 15% Merlot, 3% Cabernet Franc). Better than earlier tastings, this stellar vintage is just starting to come of age. Perhaps the best Bob Craig Affinity in a long while. One of our featured producers at the 98 and 99 Napa Wine Experience. 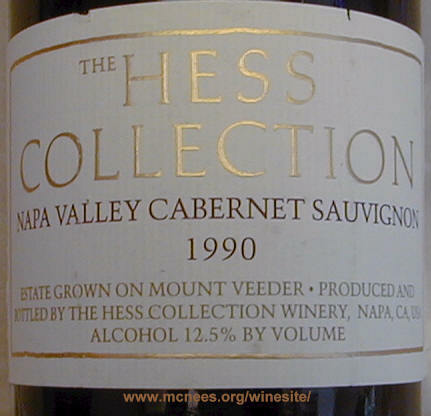 April 26, 2007 - Hess Collection Napa Valley Cabernet Sauvignon 1990 - RM 87 - Reaching end of life, certainly past its prime, the black fruit and black cherry is falling off a bit and giving way to earth and leather. April 25, 2007 - Davis Family Vineyards Russian River Valley Old Vines Zinfandel 2003 - RM 89 - Full fruit aroma and concentrated flavors of black berry, black cherry and a bit of spice. The winemaker calls if 'brown spice' flavor. This is from ancient vines planted in 1896.This old vine Zinfandel sold out in one day at the winery. April 22, 2007 - Del Dotto Vineyards Napa Valley Cabernet Franc 1998 - RM 90 - Medium bodied, slightly earthy and leathery, spicy black cherry, pepper, cassis with firm lingering tannins on the long finish. Perfect compliment to B-B-Que rib dinner on the deck w/ L, Alec, and Erin & Johnny just returned from Hawaii. April 21, 2007 - Caymus Estate Napa Valley Cabernet Sauvignon 1996 (WS 90) (RM92) ($70) Smooth, soft, full fruit with a black cherry, currant, pear, and toasty oak flavor and a nice finish. No Special Selection was produced in 96 so the 'select' grapes are found in the Estate. Blend of 87% cabernet sauvignon, 6% cab franc and 7% merlot. 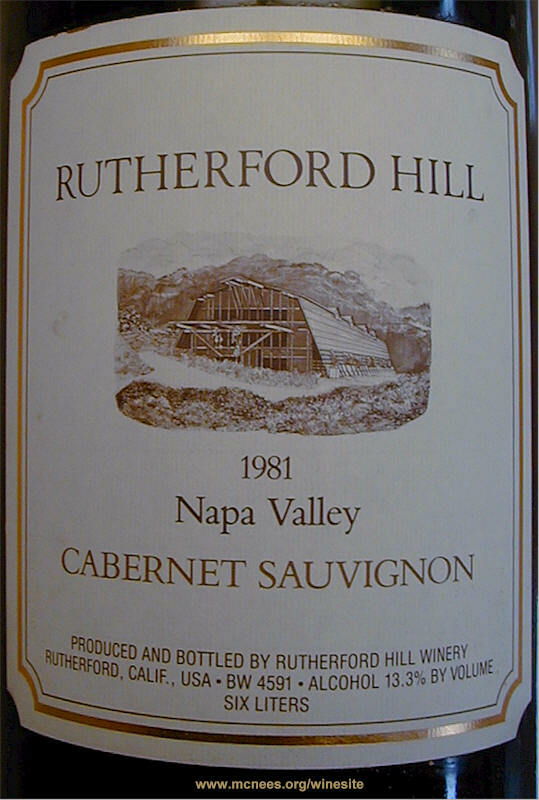 WS says it lacks complexity and fullness relative to other vintages but I found it very much in character to my other tasting experiences such as the 91 vintage which we hold in our cellar. Elyse Napa Valley Rutherford Petit Syrah 2004 - RM 88 ($29) Deep, dark purple/black color. Intense, concentration flavors that one review describes as "blackberries, espresso, soy sauce, bittersweet chocolate and spicy oak and vanilla". Tasted w/ L, Bob & Gloria at G's gala birthday fiesta. April 18, 2007 - Hanna Two Ranch Red Proprietary Blend 2001 - RM 88 - Spicy red cherry, berry and mocha on the finish. Tasted w/ L, Jackie P. and John at Francesca Amici in Elmhurst. April 16, 2007 - Chateau Beaumont Haut Medoc Bordeaux Cru Bourgeois 1989 - RM 86 - Medium bodied - earthy leathery grassy floral fragrance - cassis, smoky cherry and black berry with a moderate tannin finish. 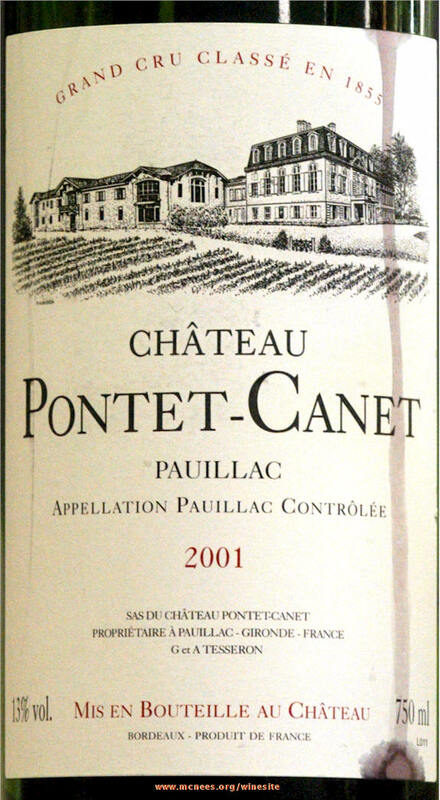 April 14, 2007 - Chateau Pontet Canet Pauillac Bordeaux Grand Cru Classe 2000 - RM 91 - Dark full bodied - elegant floral, earthy cassis, smoky black berry - long firm silky smooth tannins. 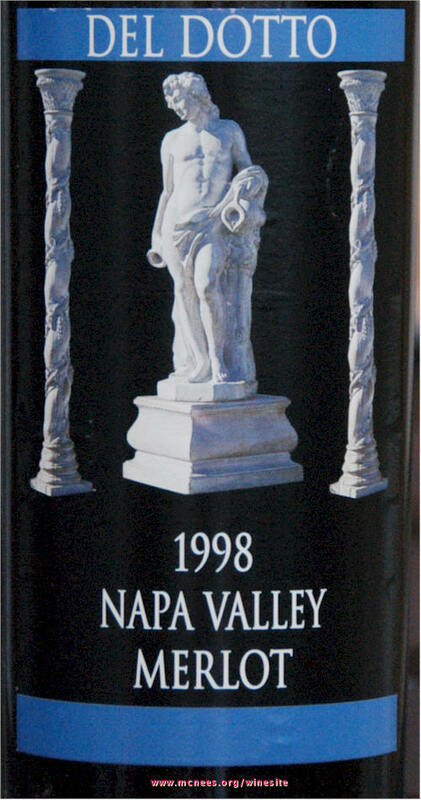 Beaulieu Vineyards Napa Valley Tapestry Reserve 1998 - RM 92 - Dark full bodied - elegant dark berry fruit predominates with silky smooth long tannin finish. 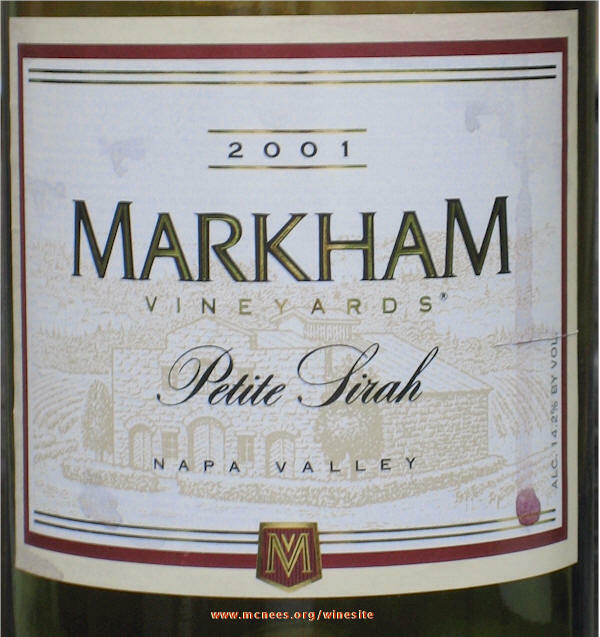 Markham Napa Valley Petit Syrah 2001 - RM 91 - $24 - Dark purple - huge fragrance and mouthful of forward fruit currant, black raspberry, an undercurrent of cedar and black pepper with a long smooth subtle mocha finish. Tasted w/ L, Dr Dan, and Bobby L at home with steak salmon dinner. Acacia Napa Valley Pinot Noir 2005 - RM 87 - Light to medium body - dark berry, black cherry, and a hint of mocha on a short modest finish. Tasted w/ Dr Dan at Malibu Grill in Bloomington. 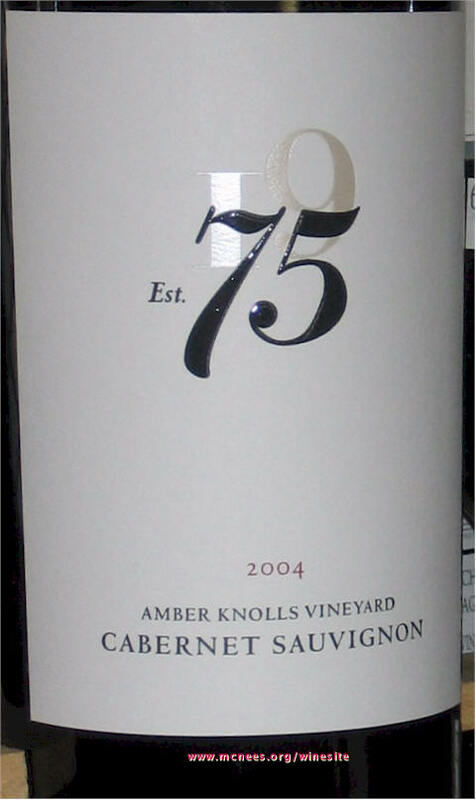 April 12, 2007 - '75' Beckstoffer Family Lake County Amber Knolls Vineyard Cabernet Sauvignon 2002 - RP 91 RM 88 - $20 - A slight hard mineral and flinty graphite edge detracts from the firm smoky dark berry and black cherry and spice. April 11, 2007 - Kunde Estate Winery Sonoma County Reserve Cabernet Sauvignon 2002 - RM 90 - Full bodied - slightly earthy dark berry, a hint of currant and cassis, with smooth tannin finish. Tasted w/ JC and BJB at Cafe in Falls Church. April 8, 2007 - Marquis Phillips McLaren Vale Shiraz 9 2005 - RM 91 - Big rich forward overly ripe dark berry, mineral and graphite. Parker loves this stuff! WA 96-98 Pts. 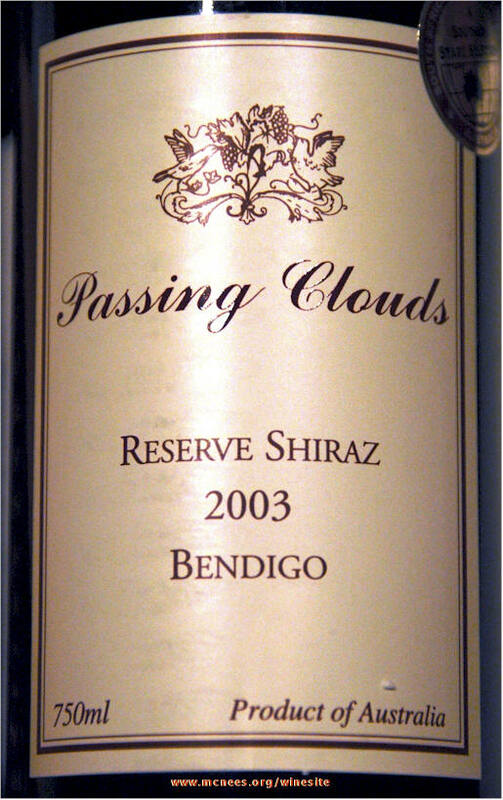 - "The 2005 Shiraz 9 (a 4,000-case cuvee that spends 18 months in new and one-year-old American oak) reveals a big, toasty, smoky nose, but the oak is beautifully absorbed by extravagant quantities of blackberry and cassis fruit intermixed with licorice, incense, and spice. 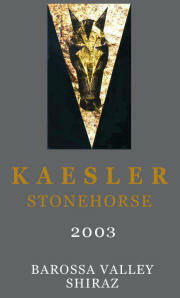 This full-bodied, powerful, rich, layered stunner should drink well for a decade." 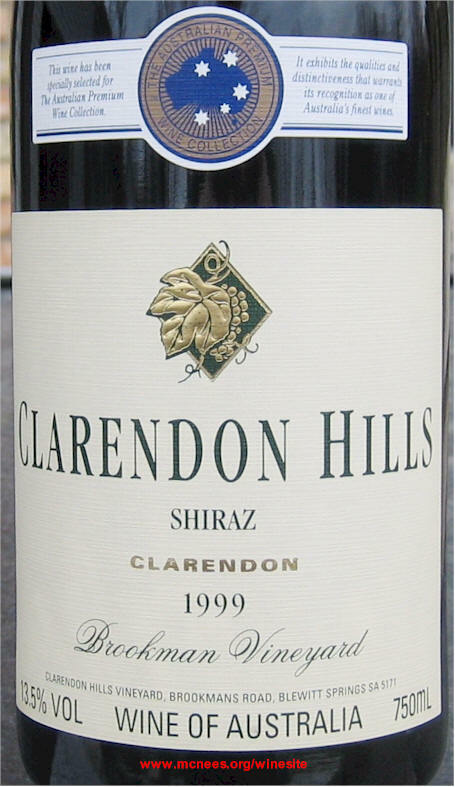 April 7, 2007 - Clarendon Hills Brookman Vineyard Shiraz 1999 - RM 90 RP 90 ST 90 - $74 - Predominant mineral graphite overpowers the dark berry fruit but is moderated by a subtle currant, earthy licorice, truffle and a wisp of caramel on the finish. 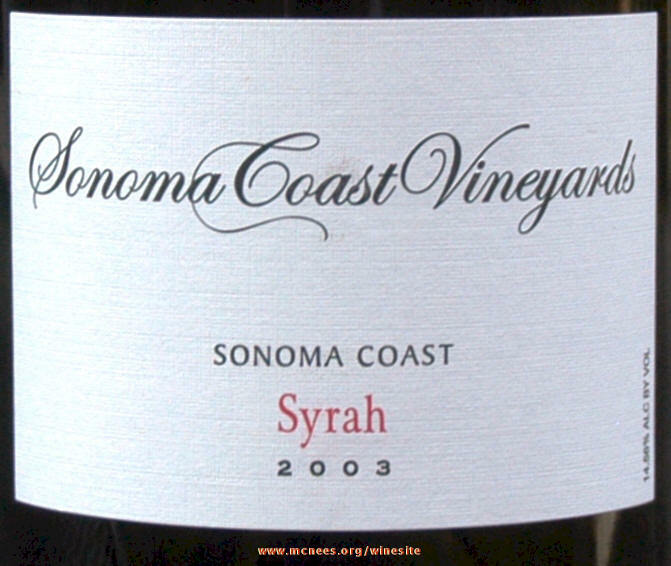 April 4, 2007 - Markham Napa Valley Petit Syrah 2001 - RM 91 - $24 - Dark purple - huge fragrance and mouthful of forward fruit currant, black raspberry, an undercurrent of cedar and black pepper with a long smooth subtle mocha finish. 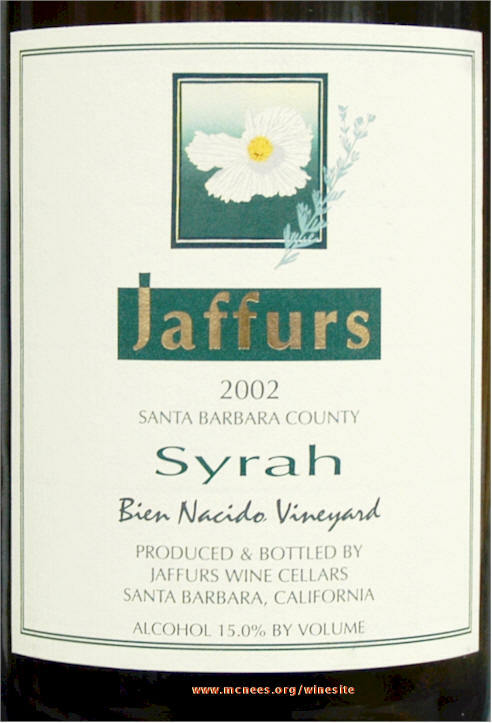 March 29, 2007 - Jaffurs Bien Nacido Vineyard Santa Barbara County Syrah 2002 - RM 88 RP 89 - $30 - Medium bodied, full forward white pepper, smoky mineral, ripe cherry, black berry, black currant, cedar and moderately firm tannins on the finish. 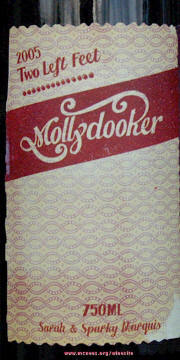 Tasted w/ L at Branmor's in B'Brook. March 28, 2007 - Navarra Red Guitar Old Vine 2005 - RM 86 - $11 - Medium bodied, dark, full fragrance of red berry fruit highlighted by graphite mineral, and tar with a hint of pepper and a moderate tannin finish. 55% tempranillo and 45% grenache. Tasted w/ Pete C & Gwen N at Cafe Elise in Munster. 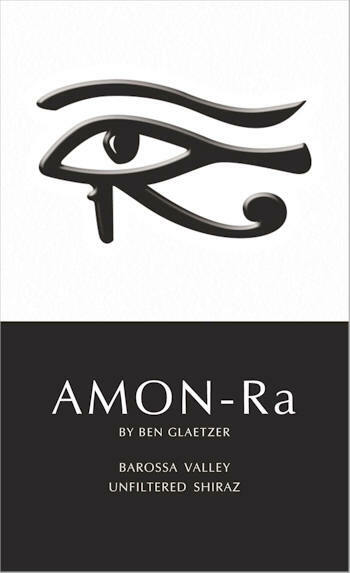 March 27, 2007 - Ben Glaetzer Barossa Valley Amon Ra 2005 - RM 93 RP 98 - $59 - Dark berry, graphite, mineral, cassis and a hint of vanilla with long silky firm tannins on the finish. Tasted at Vino Volo at IAD. 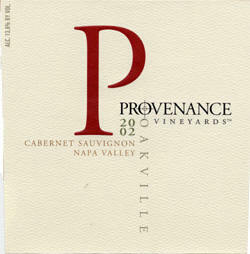 March 26, 2007 - Provenance Vineyards Napa Valley Cabernet Sauvignon 2004 - RM 90 - Polished elegant balanced fruit - currant, black raspberry, plum, oaky berry, and a hint of mocha. 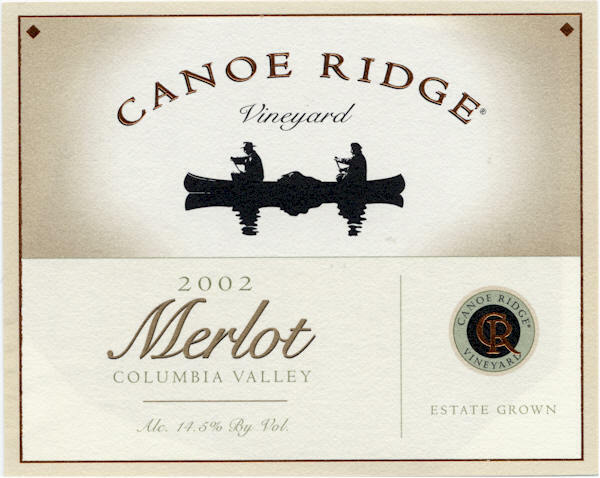 Canoe Ridge Columbia Valley Merlot 2002 - RM 88 - Forward dark berry, a hint of spicy cedar and mineral - essence of that Columbia Valley cognac taste. 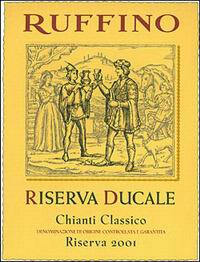 Ruffino Reserve Ducale Chianti Classico 2003 - RM 87 - Subdued medium bodied, spicy dark berry, hint of tar and mocha. Tasted w/ EU team dinner at Magiano's in Tysons II. March 22, 2007 - Markham Napa Valley Petit Syrah 2001 - RM 91 - $24 - Dark purple - huge fragrance and mouthful of forward fruit currant, black raspberry, an undercurrent of cedar and black pepper with a long smooth subtle mocha finish. March 20, 2007 - 2 Up South Australia Shiraz 2005 - RM 86 - Mineral, and undercurrent of tin and creosote overpower the fruit - good value none-the-less at $11. 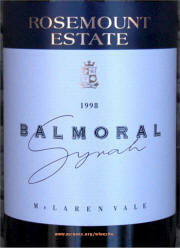 March 18, 2007 - Rosemount Estates McLaren Vale Balmoral Syrah 1998 - RM 93 - Dark garnet purple color. 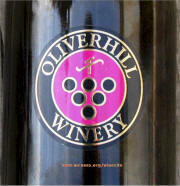 Full forward flavor of currant, black raspberry, blueberry, a hint of earthy cedar and dill on the silky tannin finish. 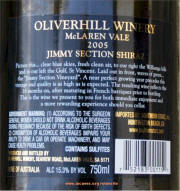 March 17, 2007 - Oliverhill Winery Jimmy Section Shiraz 2005 - RM 94 RP 96 - $35 - Rich full bodied forward fruit flavor of raspberry, plum, currant and blackberry with a fine tannin finish. 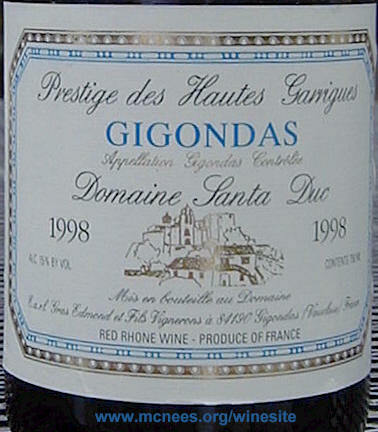 Domaine Santa Duc Prestige des Haute Garrigues Gigondas 1998 - RM 90 WS 94 - Intense black pepper, white pepper, mineral and tar predominate over the spicy dark berry. Great compliment to bbq ribs. Tasted with Bob & Gloria. 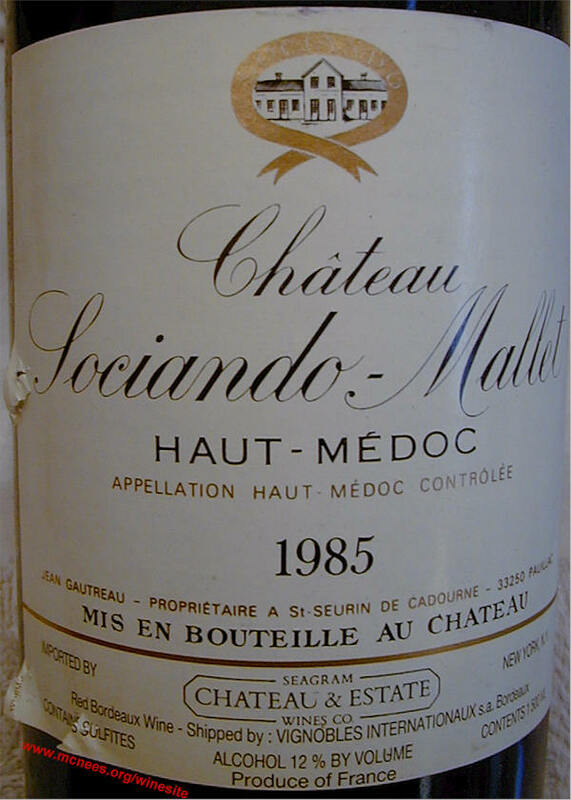 March 16, 2007 - Sociando Maillet Haut-Medoc Bordeaux 1986 - RM 87 Earthy leather, cedar, cigar box and dark berry. Cellar selection from magnum. 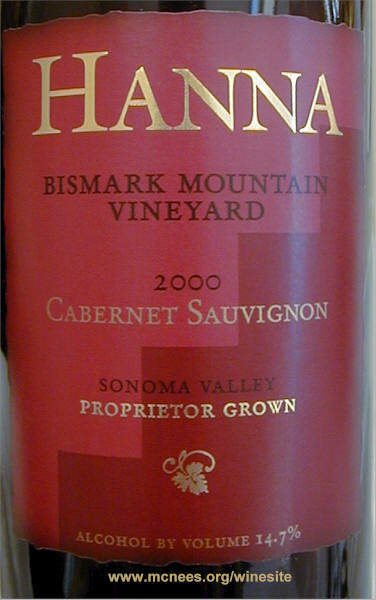 - Hanna Sonoma Valley Bismark Mountain Vineyard Cabernet Sauvignon 2000 - RM 92 - Medium bodied, smooth easy drinking, caramel, currant, red raspberry, a hint of nut and vanillaberry on the long silky finish. Domain Chandon Carneros sparkling methode champonaise - RM 88 88% pinot noir, 11% pinot menieure and 1% chardonnay. 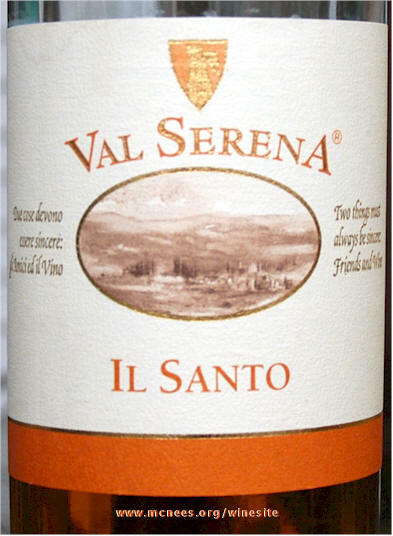 Val Serena Il Santo Toscana dessert wine - RM 86 - Smoky nut flavors predominate over the fruit. Good value. Boutari Samos Greece Muscat dessert wine - RM 87 - "A ripe and round dessert wine, sweet and smooth with plenty of body and delicious apricot flavors and aromas, though not a lot of complexity. Drink now." Reviewed By: Wine Spectator 85pts Selections from Rick's Cellar tasted w/ MIT couples fat Marie's gala milestone bday dinner. 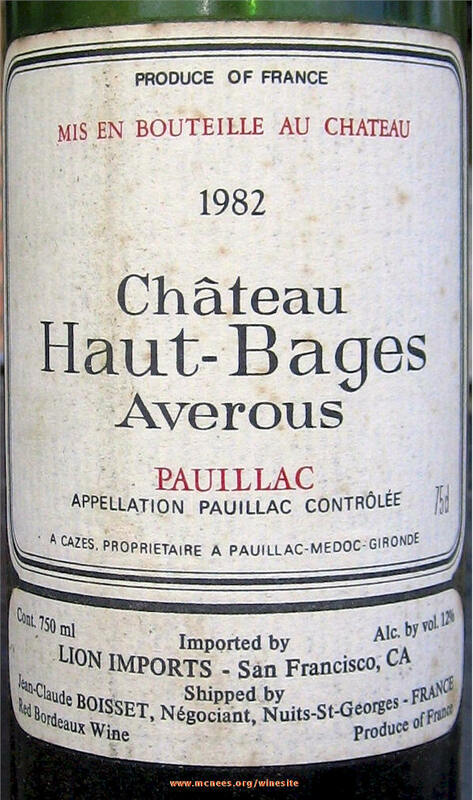 March 15, 2007 - Chateau Haut Bages Averous Pauillac Bordeaux 1982 - RM 89 WS 89 - Amazing life abounds in this 25 year old second label of Lynch Bages. Classic Bordeaux earthy floral, blackcurrant, cherry, leather, cedar and a hint of anise on the moderately tannin long finish. A birth year bottle of Ryan from the cellar to commemorate his successful West Bucktown acquisition and 'launch' today. March 11, 2007 - Flora Springs Napa Valley Trilogy meritage blend 2002 - RM 90 WS 92 - Smooth, soft after an hour of settling, medium bodied but somewhat complex dark berry, black cherry, and a hint of essence of mocha on the medium finish. Tasted w/ LJ and Ryan at Angeli's in Naperville. 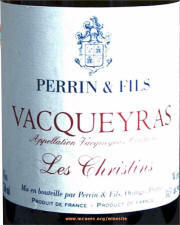 March 10, 2007 - Perrin & Fils Les Christins Vacqueyras 2005 - RM 90 - Intense forward flavor of white pepper predominates with a layer of smoky tar, cassis, and a hint of mocha on the finish. Managed by the Beaucastel team. From the commune of Sarrians, South of the Dentelles de Montmirail, between Carpentras and Vaison-la-Romaine in the Vaucluse. A blend of 75% Grenache and 25% syrah. We passed through there during our Rhone Wine Experience. tying them up with smooth, bright cherry and berry fruit that emerges on the generous finish." Poonawatta Estate Eden Valley Shiraz - RM 91 RP 95 - RP notes - "This full-bodied, inky/purple-hued Shiraz exhibits notes of lead pencil shavings, smoke, camphor, black currants, and blackberries." Tasted at Vintij Wine Boutique in Destin, FL. March 7, 2007 - Husic Vineyards Napa Valley Cabernet Sauvignon 2003 - RM 90 - Dark, full bodied, dark berry, hint of currant, tobacco, and charcoal, with a firm tannin finish. Pinneau des Charentes, Prunier, Cognac, France, Ugni Blanc & Folle Blanche - NV. RM 88 - An interesting, unique cognac infused dessert wine from aging in used cognac barrels - exhibited all the characteristics of a fine Dordogne or Sauterne, crisp, acidic, sweet, unctuous, a bit smoky - a wonderful complement to the foie gras. A thoughtful suggestion from the Seagar's crew. Tasted w/ KD, CM, and BJB at DHS conference at Seagar's Steak and Seafood at the Hilton Sandestin Resort, Destin, FL (see review). 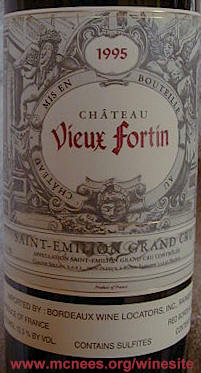 March 4, 2007 - Ch�teau Vieux Fortin St Emilion Grand Cru 1995 - RM 89 RP 86 - Dark, earthy, medium bodied, blackberry, charcoal and a slight hint of cassis, dark chocolate and spice on the long moderately tannin finish. 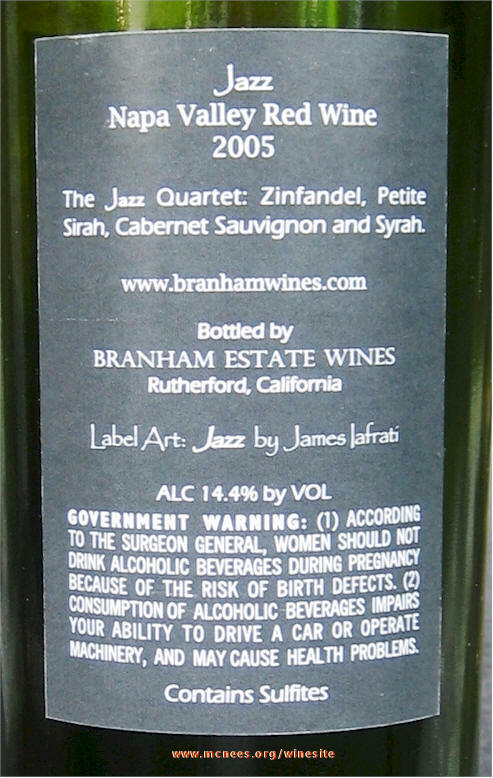 March 3, 2007 - Haan "Prestige" Barossa Valley Shiraz 2003 - RM 92 - Dark, rich, medium bodied full fruit flavor of black raspberry, loganberry, a hint of currant and bing cherry. Tasted with L, Ryan & Michelle, and Pat at Scylla Restaurant. 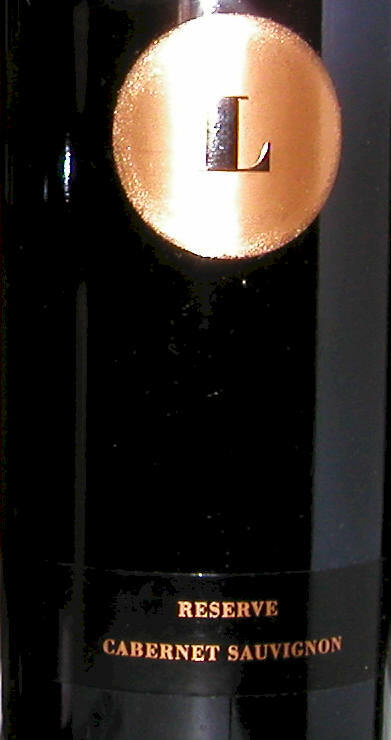 March 2, 2007 - Del Dotto Vineyards Cave Blend 2000 - RM 90 - Full fruit, flavor of dark cherry, anise, a hint of licorice on the finish. February, 28, 2007 - Kaesler Stonehorse Barossa Valley Shiraz 2004 - RM 89 RP 93 - Dark rich full bodied, full flavor, chewy black raspberry, ripe plum, a hint of licorice and pepper, are overtaken by mineral and graphite on the finish. 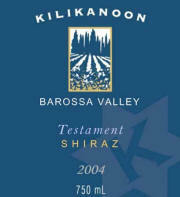 February 24, 2007 - Kilikanoon Barossa Valley Testament Shiraz 2004 - RM 91 - RP 95 - $39 - Dark inky purple color. Rich, intense forward blackberry, white pepper, mineral (Parker calls it creosote), and what RP aplty describes as 'singed' leather, with a long firm lasting finish. A bit harsh, needs time to soften. February 21, 2007 - Marquis Phillips Barossa Valley Shiraz '9' 2001 - WS92 RM92 $39 - That distinctive 'burnt sugar creme brulee' taste from earlier tastings is turning a bit 'darker' with age. 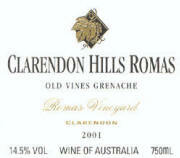 Full, forward rich and dense ripe fruit. HS of WS calls it 'exotic spice' taste, "very ripe and dense, with rich blackberry jam flavors, which echo on the long silky smoky finish". Not as rich, chewy or polished as the Hazy Blur below. 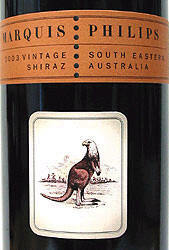 February 14, 2007 - Hazy Blur South Australia Kangaroo Island Shiraz 2004 - RM 93 $39 - Dark, full bodied, thick chewy, pepper, black raspberry, black cherry, ripe plum, hints of smoke, cedar and smooth tannins on a long finish. 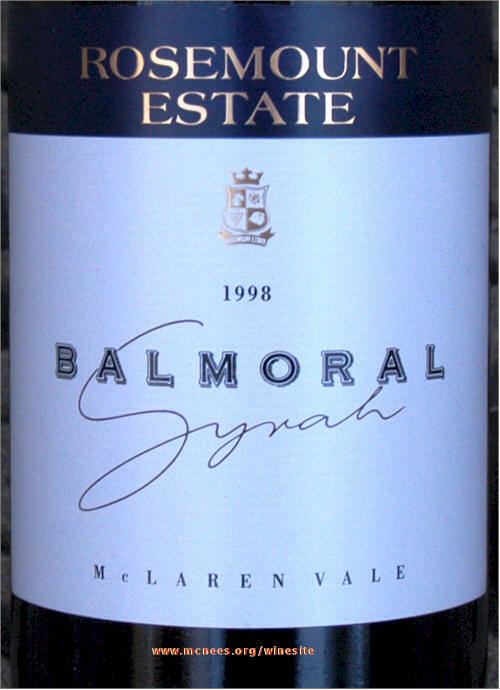 February 13, 2007 - Rosemount Balmoral McLaren Vale Shiraz 1997 - RM 90 - Dark, medium bodied, smoky, earthy blackberry and anise. 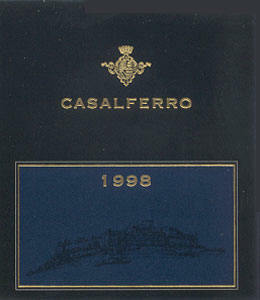 February 11, 2007 - Baronne Ricasoli Casalferro Toscana 1988 - WS 92 RM 88 - Dark, medium-full bodied earthy, smoky leathery black fruit, a hint of camphor on a firm tannic finish. Blend of Sangiovese and Merlot. 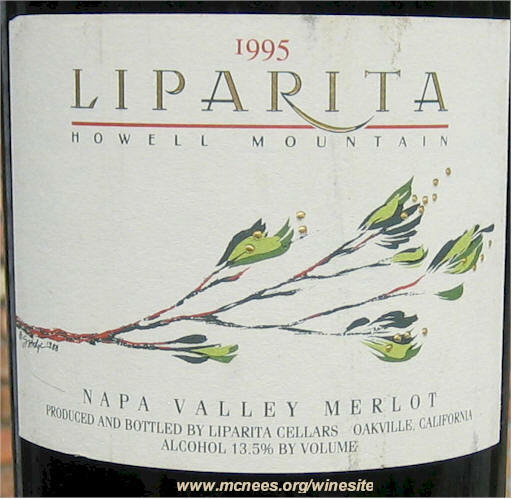 Liparita Napa Valley Merlot 1995 - RM 88 - Medium bodied, slightly earthy black cherry and a hint of black raspberry and leather. From Magnum. Kracher #9 Chardonnay Trockenberren Auslese 1998 - RM 93 Robert Parker 97 - Rich unctuous, colour of caramel, weak tea or light maple syrup - smoky, subtle honey, apricot and hint of orange. February 4, 2007 - Snowden Vineyards Napa Valley Estate Cabernet Sauvignon 1995 - RM 91 WS 93 - Earthy, leathery blackberry, black cherry, a hint of currant, tea and herb with firm integrated tannins. 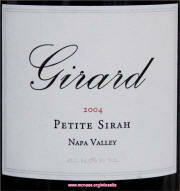 Girard Napa Valley Petit Syrah 2004 - RM 90 WS 90 WE 92 Big thick chewy extracted forward fruit of blackberry, ripe plum and black cherry. 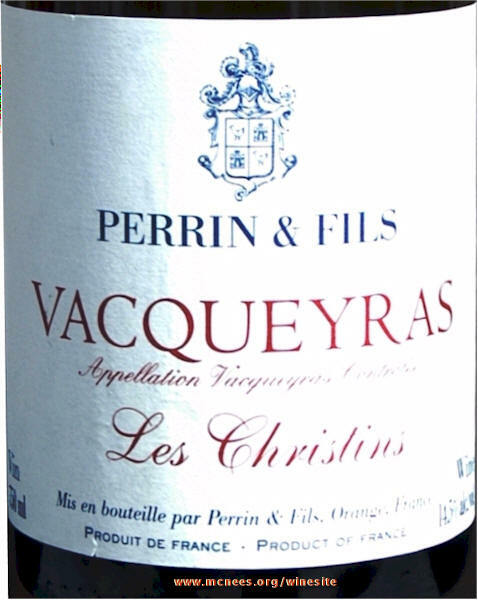 Very firm, sophisticated but silky and finely integrated tannins. Not for the feint of heart. This is a blend of 90% Petite Sirah, 8% Zinfandel and 2% Carignane. Great value at $20. A Rick's Pick. 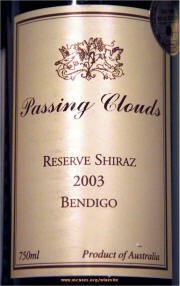 February 1, 2007 - Passing Clouds Reserve Bendingo Australia Shiraz 2003 - RM 91 RP 92 - Review from The Wine Advocate #161 10/31/05 "An outstanding Shiraz from the cooler-climate region of Bendigo, this blockbuster 2003 was aged for 12 months in American hogsheads. It boasts an opaque blue/purple hue as well as a big, rich perfume of camphor interwoven with blueberries and blackberries, opulent, full-bodied flavors, superb depth, a chewy texture, and a long finish with plenty of heady glycerin and alcohol (15.3%). It should drink well for 7-10 years." January 27, 2007 - Tait Ballbuster Barossa Valley 2005 - RM 87 RP 92 - Parker calls this a 'fruit bomb'. Like the Mettler below, the fruit gives way too much to distracting tones of mineral and smoke to warrant such a high rating. 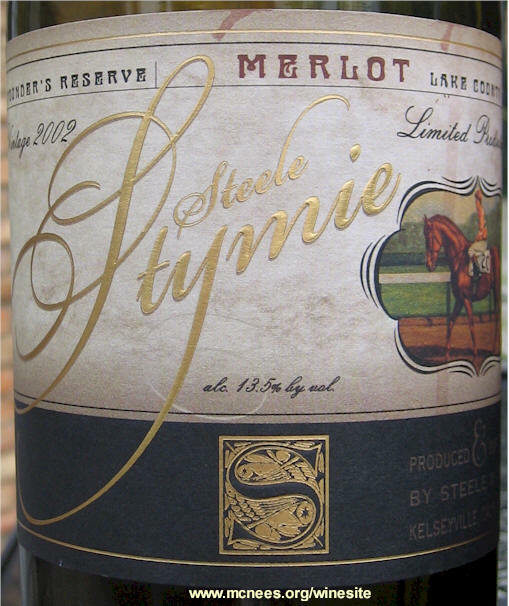 This is a blend of 80% Shiraz, 10% Cabernet Sauvignon, and 10% Merlot. It priced right at $16. 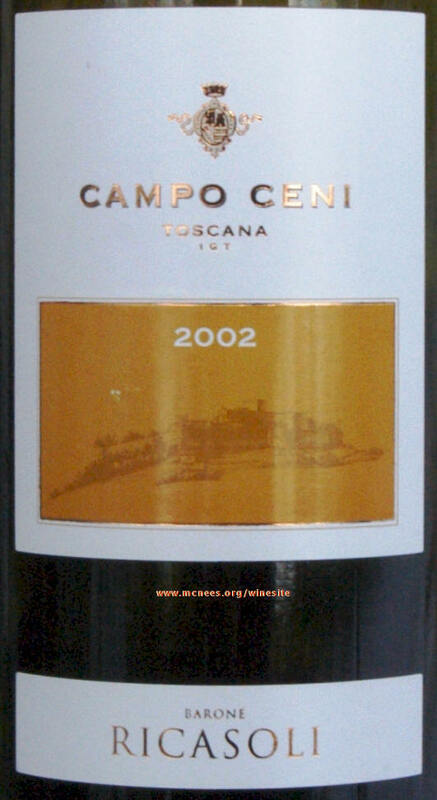 Barone Ricasoli Campo Ceni Toscano Sangiovese 2002 - RM 88 WS 86 - Firm smooth nicely integrated tannins, dark medium bodied modest fruit of blackberry, black cherry, a hint of mineral and tobacco. Great value wine and good complement to hearty Italian cuisine; tasted w/ Erin and Johnny and L at Angelis Restaurant in Naperville. 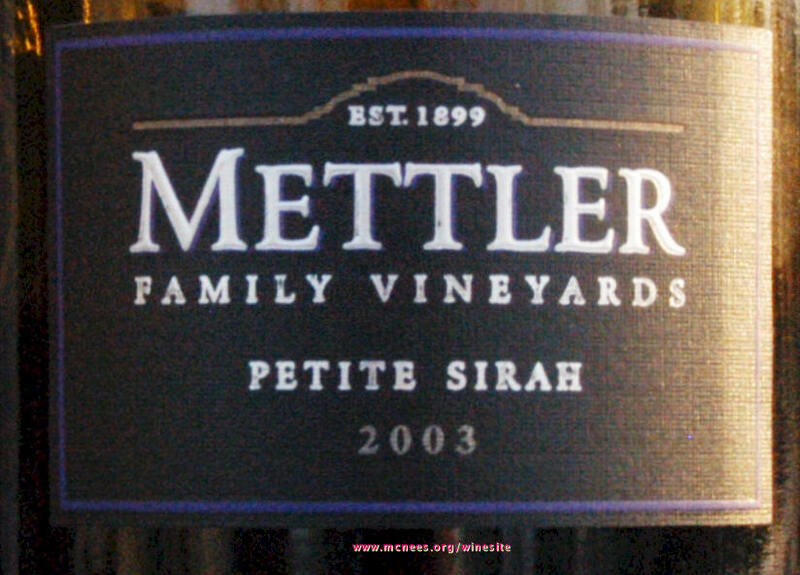 January 26, 2007 - Mettler Petite Sirah 2003 - RM 88 WE 90 - Deep dark purple color, full forward fruit of blackberry, boysenberry, and spice that is offset by a hint of tar, cedar and mineral that detracts from the fruit that falls off short. 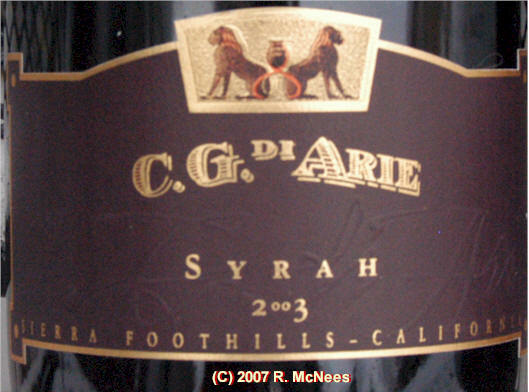 January 21, 2007 - C. G. Di Arie Amador County Syrah 2003 - RM 91 - Deep garnet purple colour, mouthfull of forward fruit of black raspberry, cherry and dark plum with firm finely integrated tannins on a long smooth finish of coffee and tobacco. A Rick's Pick. 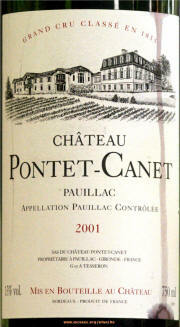 January 18, 2007 - Chateau Pontet Canet Grand Cru Classe Pauillac Bordeaux 2001 - RM 90 WS 90 RP 89-90 ST 91 - Medium bodied, bright, earthy floral, and big but soft and finely integrated tannins predominate over the black cherry fruit and hint of anise and tobacco with a big long finish. Fabulous compliment to the seared tuna at O'Leary's fine seafood restaurant in Eastport next to Annapolis. 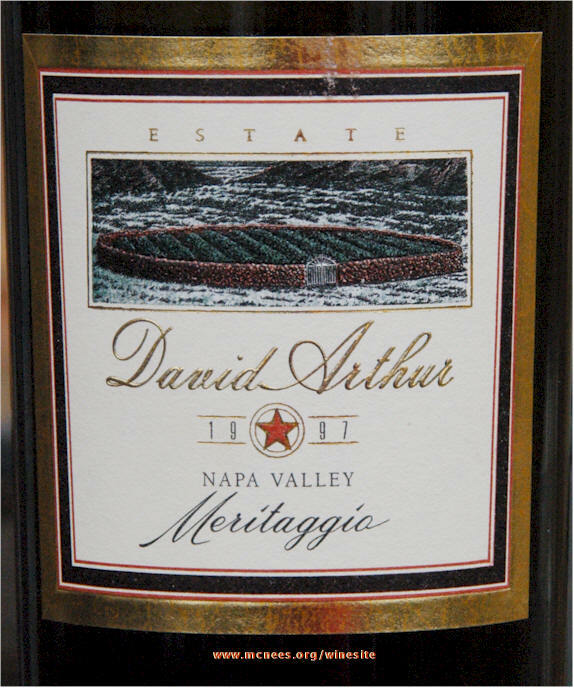 January 13, 2007 - David Arthur Napa Valley Meritaggio 1997 - RM 90 - Girard Napa Valley Petit Syrah 2004 - RM 91 WS 90 WE 92 Big thick chewy extracted forward fruit of blackberry, ripe plum and black cherry. 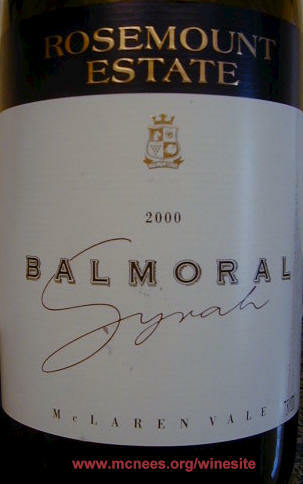 Very firm, sophisticated but silky and finely integrated tannins. Not for the feint of heart. This is a blend of 90% Petite Sirah, 8% Zinfandel and 2% Carignane. Great value at $20. A Rick's Pick. 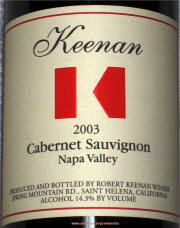 Markham Napa Valley Petit Syrah 2005 - RM 88 - Newton Unfiltered Merlot 2001 - RM 87. 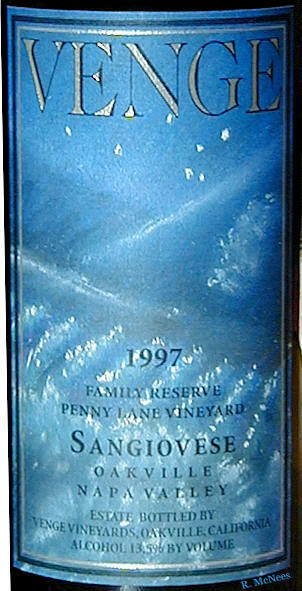 January 11, 2007 - Venge Napa Valley Oakville Penny Lane Family Reserve Sangiovese 1997 $30 RM 86 WS 86 Medium bodied, predominant cedar aroma and taste coupled with earthy leather and a slight grassiness that detracts from the fruit of spicy cherry and anise which fall off in a soft finish. 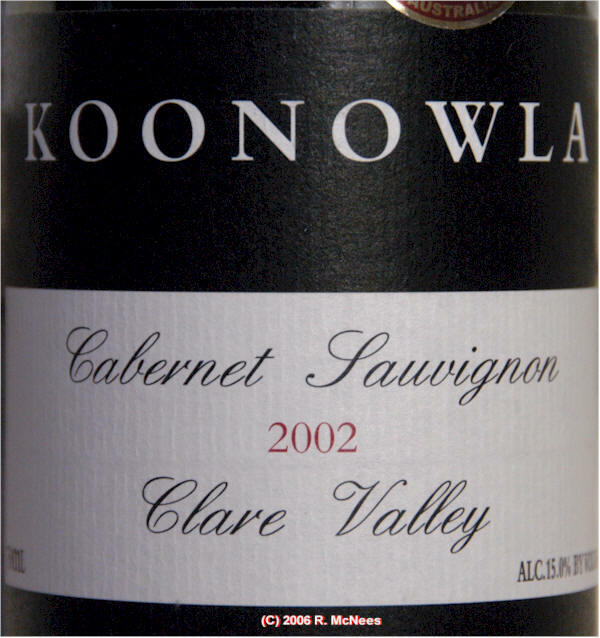 January 9, 2007 - Koonowla Clare Valley Cabernet Sauvignon 2002 - RM 90 RP 89 - $26 - Dark, thick rich, full bodied, smoky currant, firm tannins, bark, mulberry and cedar and on the long full finish. January 6, 2007 - Del Dotto Vineyards Napa Valley Merlot 1998 - RM 89 - Full fruit filled, full bodied - blackberry, black cherry, a hint of mocha, licorice and tar on the finish. 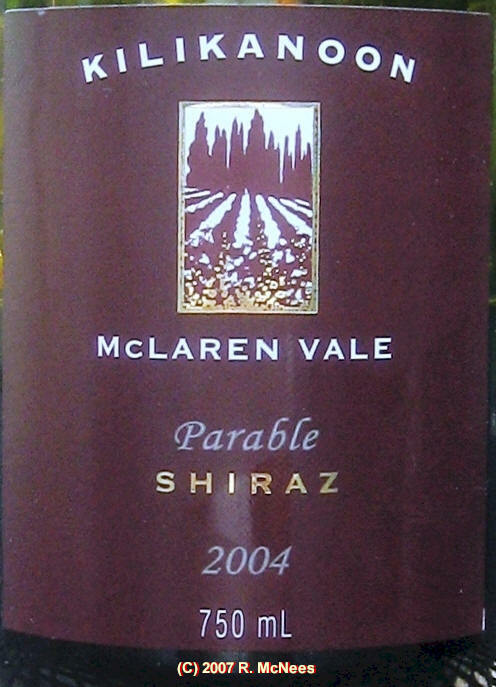 January 4, 2007 - Rosemount Balmoral McLaren Vale Shiraz 1995 - RM 90 $39 - Dark full flavor, black berry, a hint of blueberry and plum fruit, with spice, anise, smoke and tar on the long full finish. 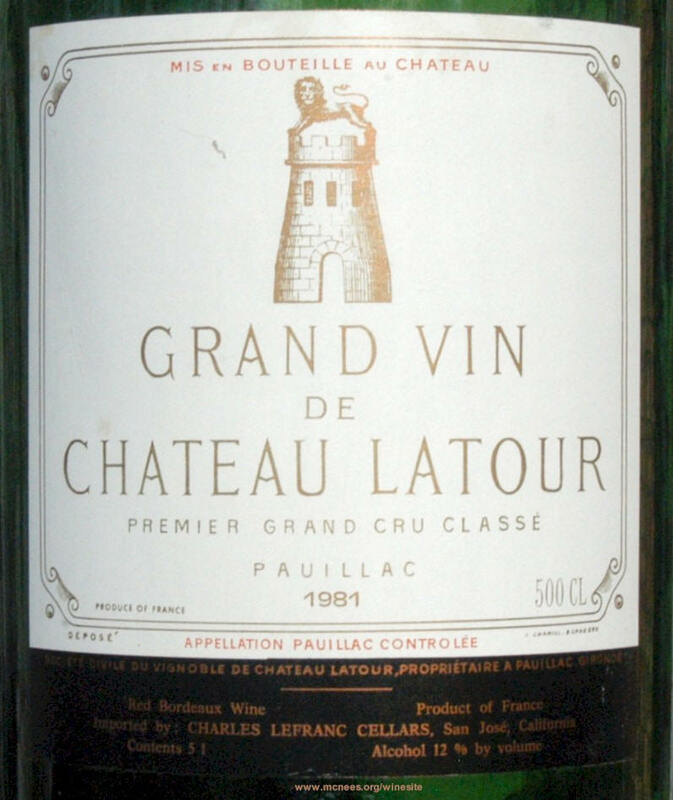 December 30, 2006 - Chateau Latour Grand Vin Pauillac Bordeaux 1981 Jeroboam - Grand Vin de Leoville du Marquis de Las Cases, St Julien Bordeaux 1981 Jeroboam - Jaeger Vineyards Inglewood Vineyard Sonoma County Merlot 1981 Imperial - Rutherford Hill Vineyards Napa Valley Cabernet Sauvignon 1981 Imperial - Balverne Vineyards Sonoma County Cabernet Sauvignon 1981 Imperial - Domaine Chandon Brut Cuvee Sparkling Wine (Methode Traditionelle) 2000 Milennium Salmanazar (9L) 63% Sonoma County 37% Napa County. 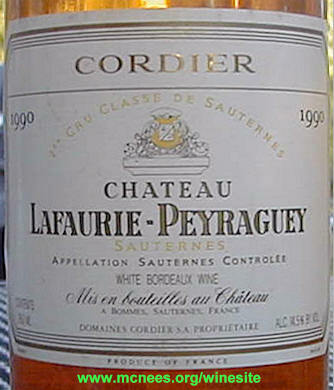 Chateau Lafaurie-Peyraguey, Sauterne, Bordeaux, 1981 and 1997; Ch�teau Puy Servain, "Terrement", Haut Montravel, Dordogne, 2003. 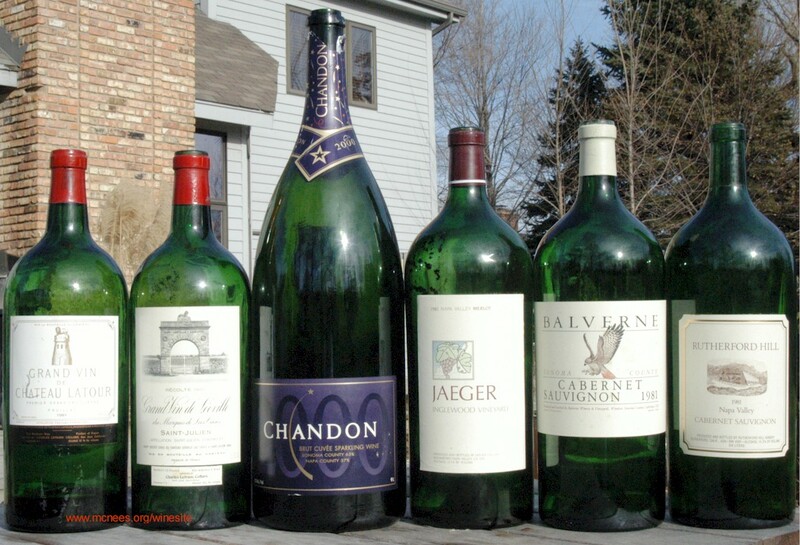 Selection of large format bottles and dessert wines served at Erin & Johnny's gala wedding reception. These bottles were featured in my Wine Spectator Collector interview. 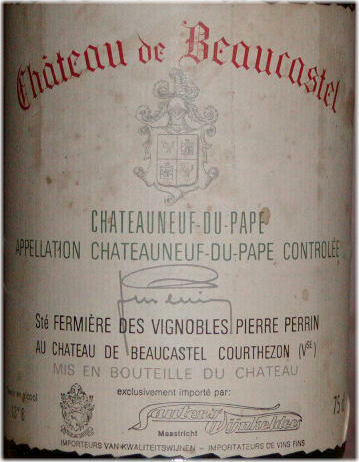 December 25, 2006 - Ch�teau de Beaucastel Ch�teauneuf du Pape 1981 - RM 88 WS 96 - The parade of 81's continues as we count down to the big day. This CDP was medium bodied and austere in colour with a slight rust on the edges revealing its age. 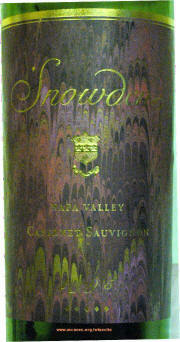 Earthy leather overtook the black cherry and berry fruit. WS Oct 15, 1991 Review. 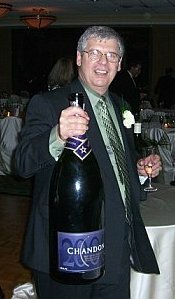 "A giant of a wine. Decant a few hours before serving if you want to drink it now. Deep in color, with super-ripe game, chocolate and tobacco aromas. Full-bodied, with a thick, massive fruit structure and tons of tannins. Has a gigantic finish." 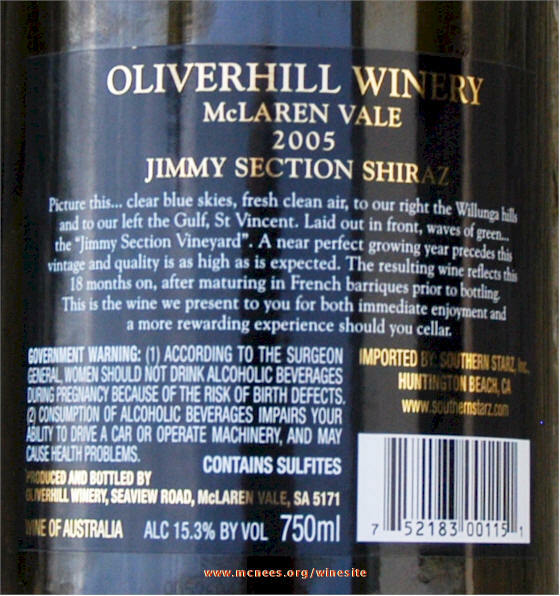 OliverHill Shiraz 2004 - RM 92 RP 93 - Deep dark purple - rich, thick chewy tannins and full bodied fruit of black berry loganberry and ripe plum. Medley of contrasting styles and tastes rounded out with the remaining Lucia Pinot Noir from yesterday - great selection for our gala festive holiday dinner with L, E&J, R&M, and Alec. 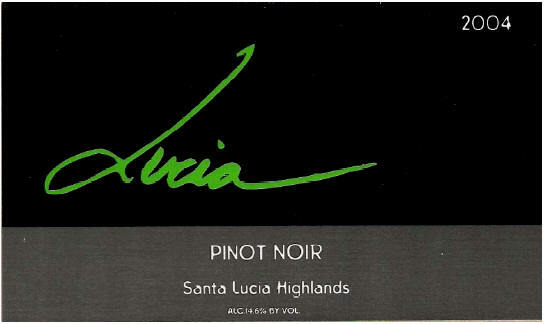 December 24, 2006 - Lucia Santa Lucia Highlands Pinot Noir 2004 - RM 92 - Winemaker's notes: "The density of this wine is immediately evident on the nose. 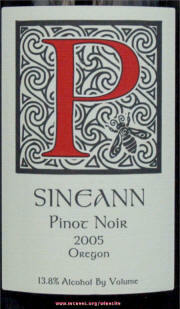 It is a spicy, fruit-driven Pinot Noir. Dark fruits including black cherry, blueberry combine with delicate tannins to create a very food-friendly Pinot Noir is a cuvee of various lots in the cellar. 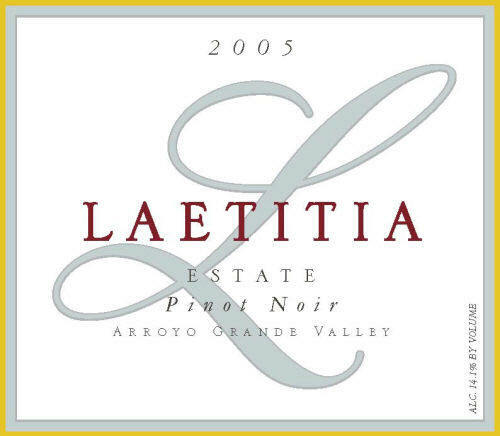 Generally a blend of equal parts from Garys� Vineyard and Pisoni Vineyards." December 21, 2006 - Chappellet Napa Valley Chenin Blanc 2003 - RM 89 - Light, bright easy drinking - zesty and spicy with flavors of tropical fruits and citrus, crisp acidity - rich but subtle flavors of orange, pineapple and a hint of anise and eucalyptus on the soft finish. Tasted w/ L at Parker Grill in Downers Grove. 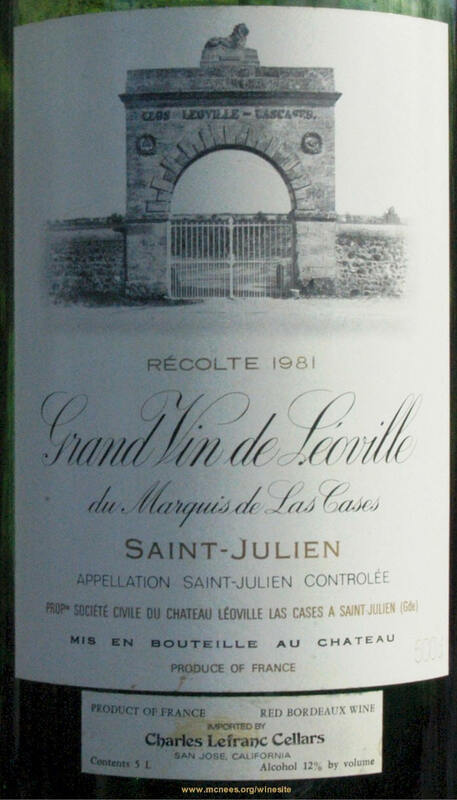 December 17, 2006 - Chateau Leoville Las Cases St Julien Bordeaux 1981 - RM 88 - Floral bouquet, earthy leather, cigar box, dark berry, a hint of black cherry with a smooth long tannic finish. Erin's birth year wine to commemorate her Master's graduation today. 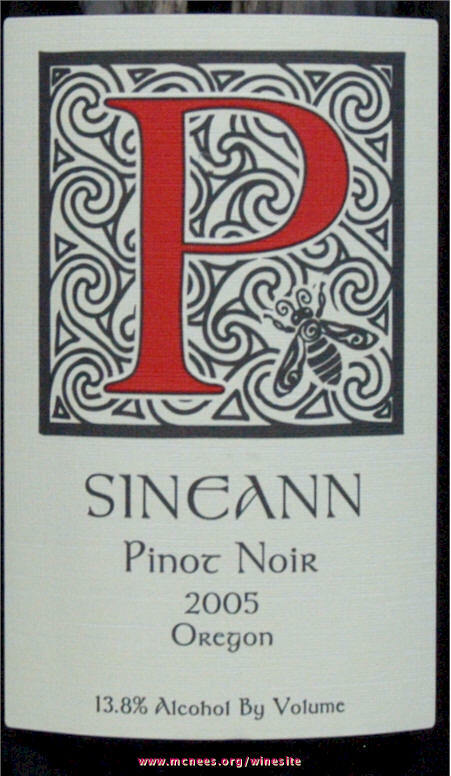 December 16, 2006 - Sineann Willamette Valley Oregon Pinot Noir 2005 - RM 89 - Big full bodied firm dark and smoky with layers of black berry with a long full finish. Mollydooker "Two Left Feet" McLaren Vale Shiraz Blend 2005 - see review below. Tasted at home with L, Pat R. and friend Richard after Denver and the Mile High Orchestra concert at EFCN. Central Coast Meritage 2003; Groom Barossa Shiraz 2002; Ch�teau Puy Servain "Terrement" Haut Montravel Dordogne 2003 - Wine flight of 1990 reds commemorating birth-year of ATM and friends for gala beef tenderloin holiday family dinner - with both sets of twins, CC, David R., Brian B., Brian L. and families. 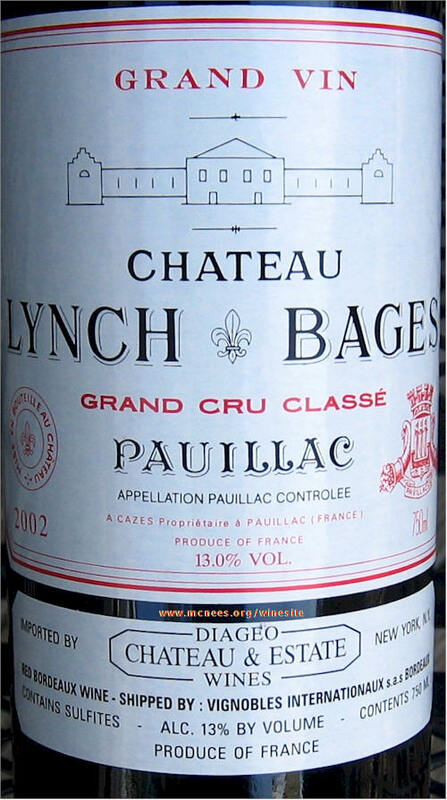 RM 91 - Medium bodied, classic Bordeaux aroma and tastes of floral, earthy leather, cigar box, black cherry, black berry, anise, and silky smooth tannins. From the 1981 horizontal collection commemorating Erin's birth-year - broken out for the upcoming big event, and celebrating Marlene's birthday and 25 years of friendship, w. L at Phil Stefani's new Riva restaurant in Naperville. 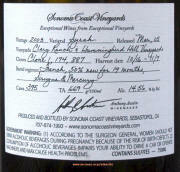 December 8, 2006 - Ch�teau Puy Servain "Terrement" Haut Montravel Dordogne 2003 - RM 89 - Butter colored. Thick unctuous syrup - full bodied, full flavored smoky throughout from sweet pear to red delicious apple and brown sugar on the finish.